Why are parts hard to find? Send us a picture of your Roaster! In addition to roasters, we have a Calendar of Swing Dancing in DC, a Directory of Vintage Clothing Stores and a Guide to 1940s Collectibles. Thanks for tuning in! Feel free to Contact Me if you have questions or want to share photographs and appliance stories with the rest of the readers. This page is part of a website devoted to swing dancing and retro culture from the 1930s through the 1950s. 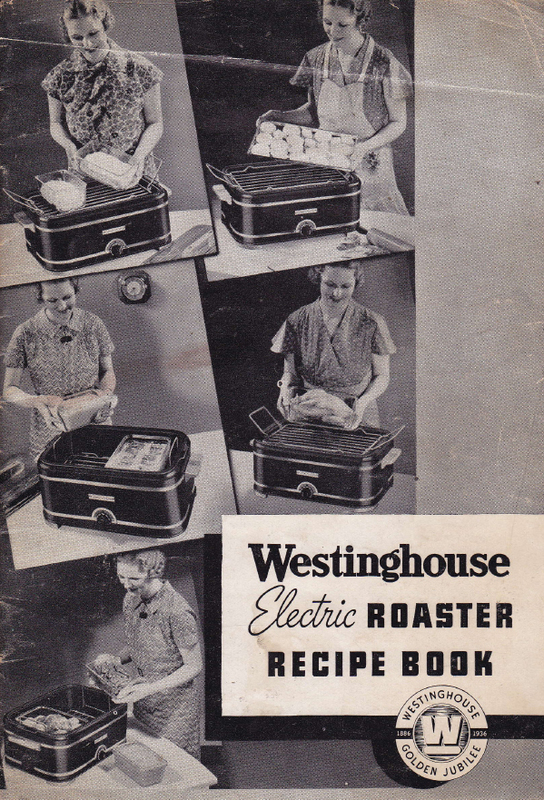 You may be asking yourself, "Why do they have a special page about Westinghouse Roasters?" 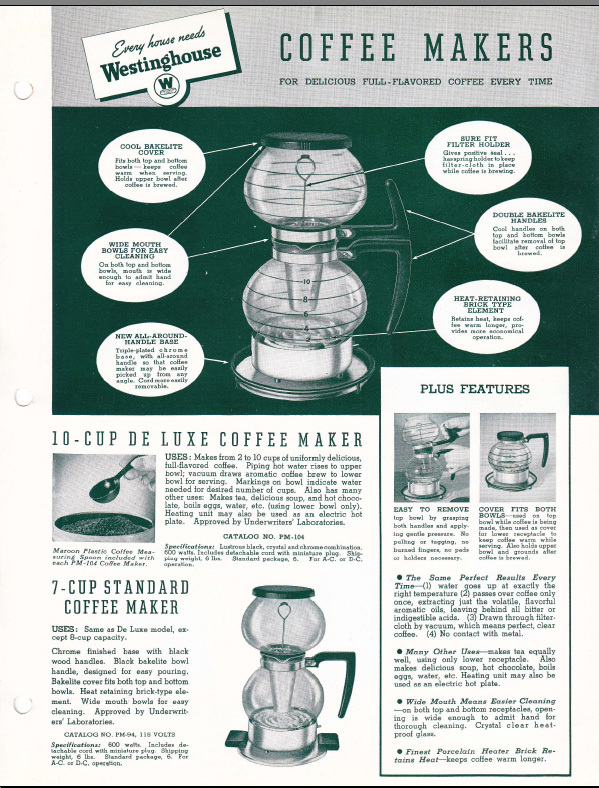 The answer is purely statistical --- we get more mail about the Roasters than any other collectible. 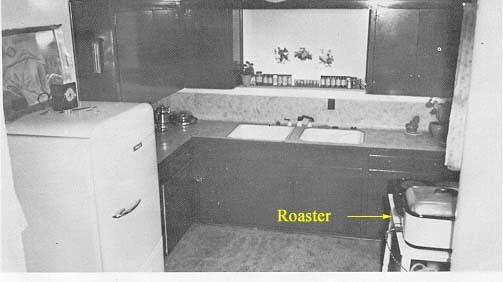 Further, we keep finding pictures of the Roasters and their associated support devices -- they were beginning to swamp their former category, Kitchen Appliances. 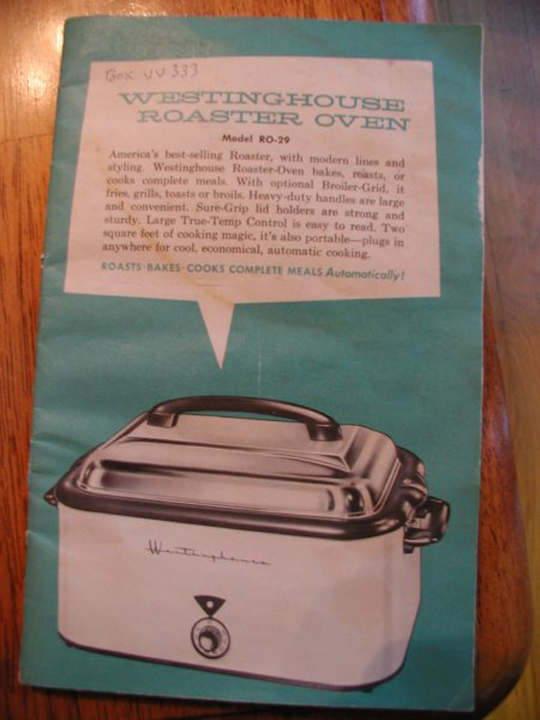 The Westinghouse Roaster is always included in period ads about the "ideal kitchen" -- as shown in the above photo. We have information about most of the other appliances on the "Wheel of Fortune" on out Kitchen Appliances Page, including the Pressure Cooker, the Fryryte, the C30 CoffeeMaster and the like. 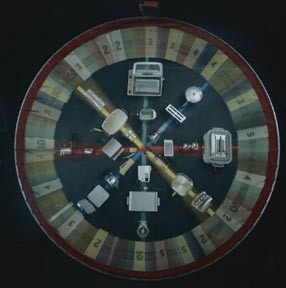 Click here if you are looking for parts. 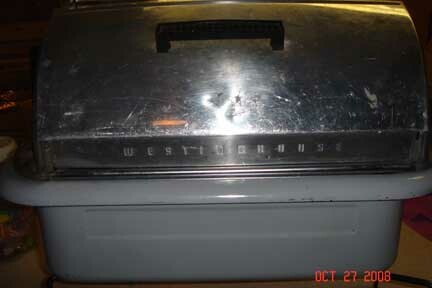 With all its faults, I still love my Westinghouse Roaster. It occupies a proud place in my kitchen! 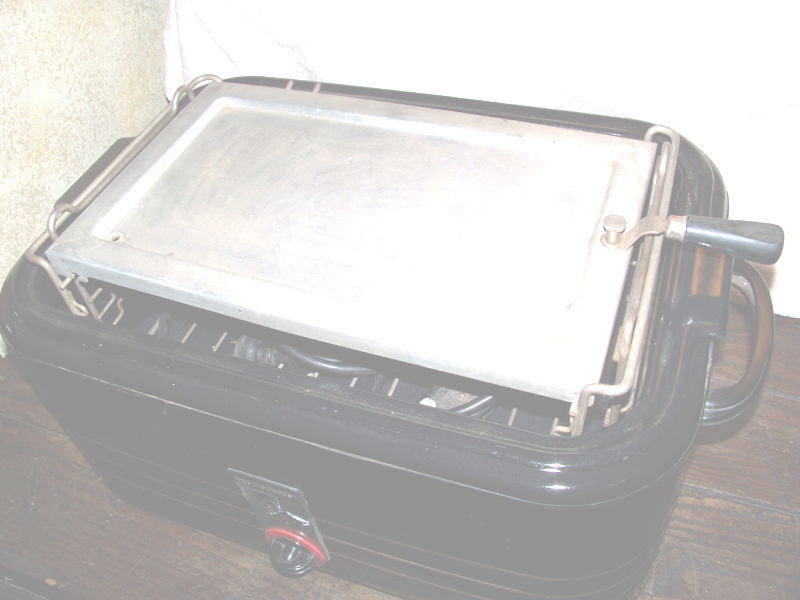 Most families used this as an auxiliary oven, especially during the holidays. 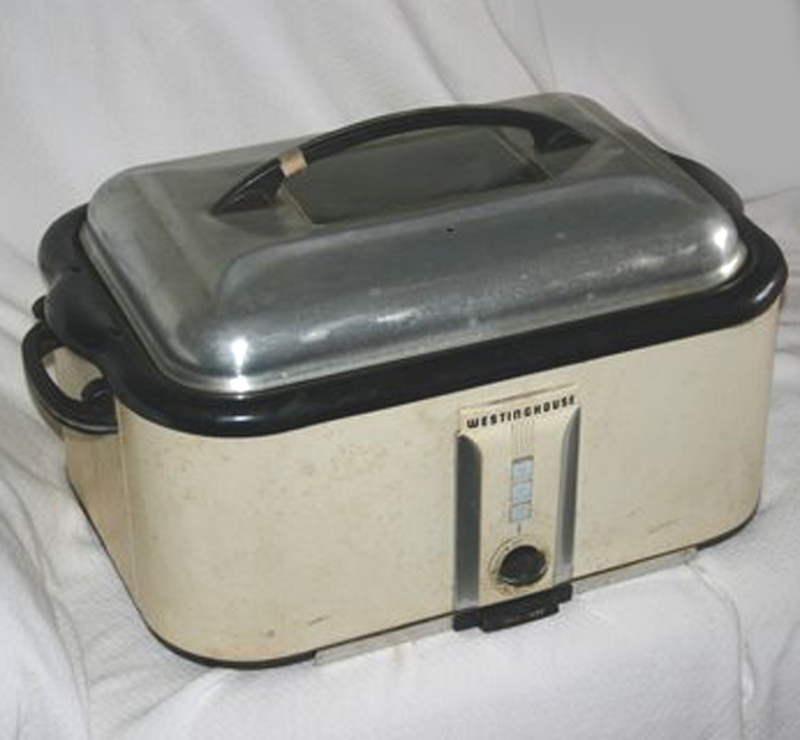 My personal memory is that the thing was used to make lasange for Sunday dinners (like about 25 people...). Also, on Christmas eve, the oven was used to keep Zeppole (sort of like doughnuts, but better) warm. Thus, it was with a wave of nostalgia that I seized upon the opportunity to buy one of these remarkable devices. The fact that both pieces were only $5 (at a rescue mission in Winchester) served only to reinforce my decision. 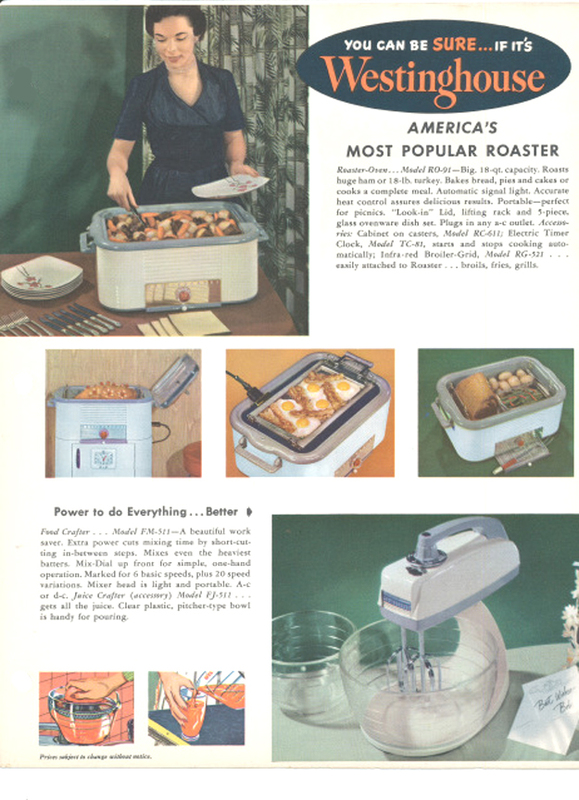 Westinghouse made kitchen roasters from 1936 through the 1960s. Thanks to Roberta, our Consulting Roaster Guru, we have been able to prepare this chart of the various models and the approximate time that they were in the marketplace. 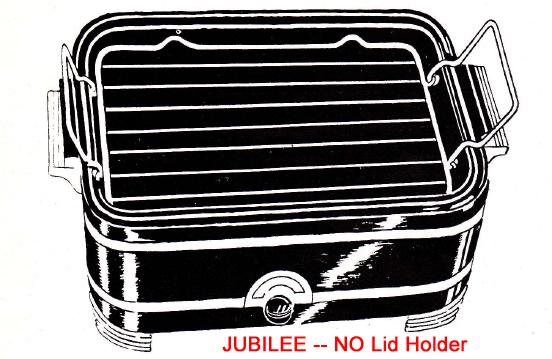 Basically, the earliest model (the "Jubilee") did not have a lid holder. 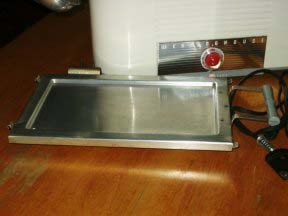 If you have used a roaster, there is always a problem of where to put the lid while you are basting -- there is a good deal of condensation and it will create a puddle if you set it down right side up. If you can manage to put it upside down on a table without burning yourself, the lid is unstable. 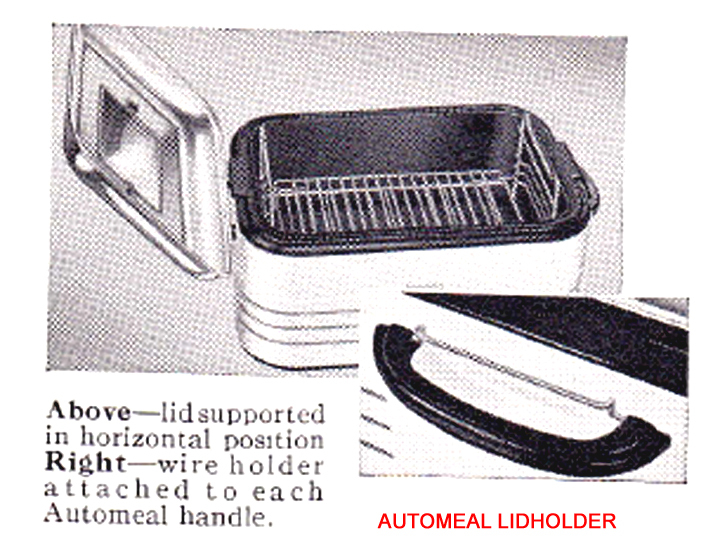 Thus, the engineers of Westinghouse came to the rescue with the "Lid Holder". 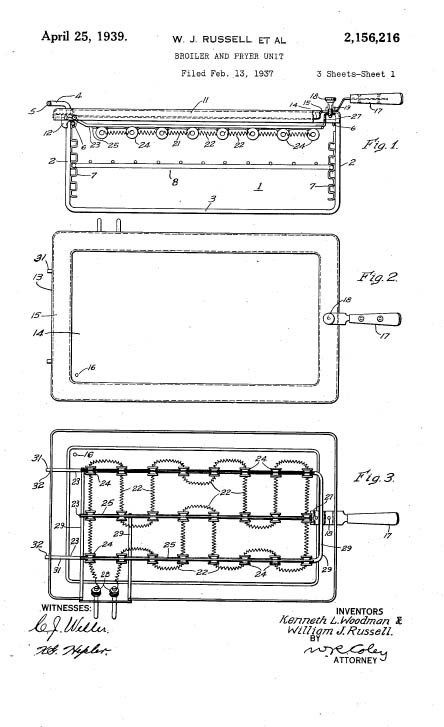 In the Automeal, theis took the form of a wire bail. 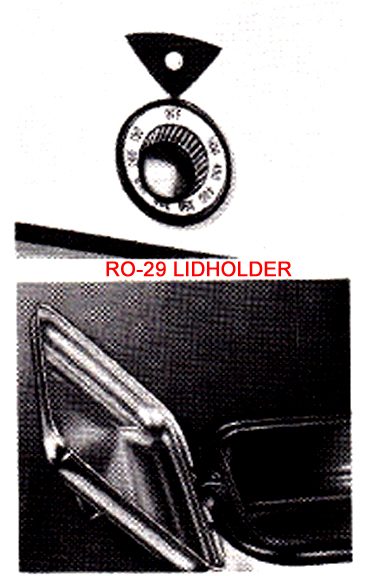 In the RO-29, the lid holders are metal pieces, separate from the handles. 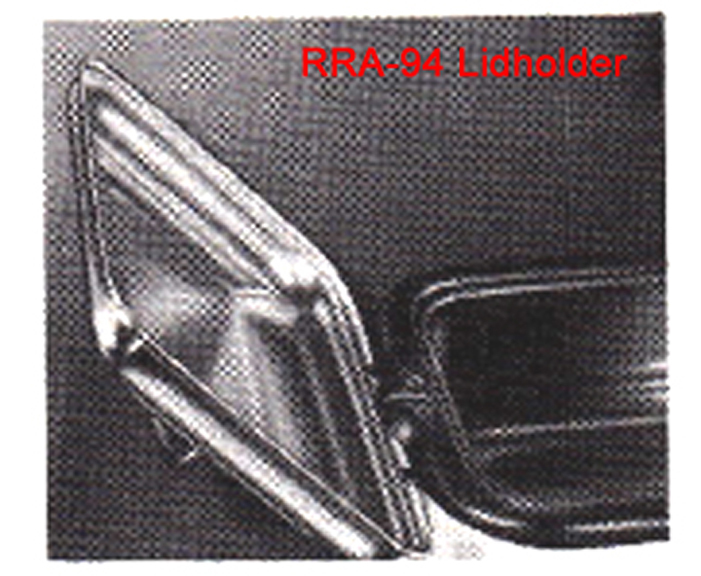 Following this, from the RRA-94 through the RO-91, the handle plus two lid holders were molded into one piece. 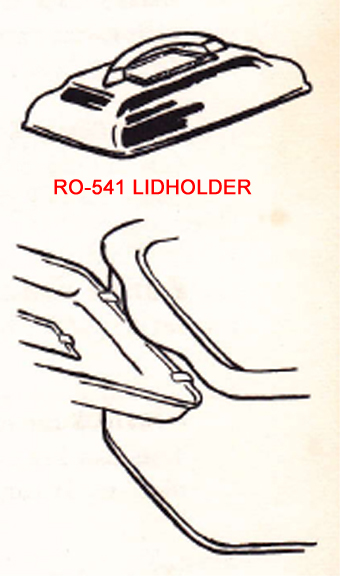 The RO-541 series went back to the metal pices, reverting to the RO-29 design. At thanksgiving time, many of you may be wondering if you can cook a turkey in the Westinghous Roaster. The answer is DEFINITELY YES! Clean and stuff turkey using favorite dressing recipe. Place turkey on rack in large inset pan. 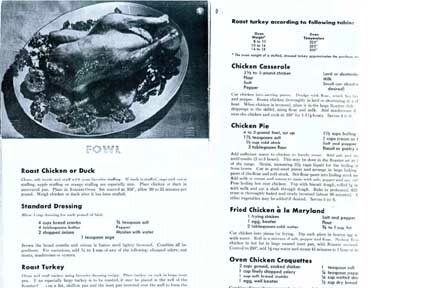 If an especially large turkey is to be roasted, it may be placed in the well of the roaster-oven on a flat shallow pan and the inset pan inverted over the well to form the cover. 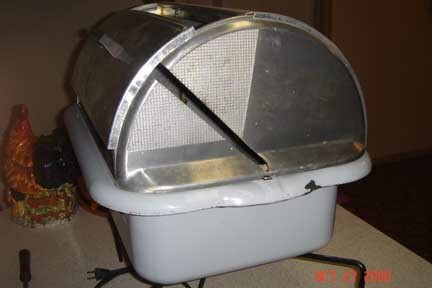 The small pin on either side of the well will hold the inset pan in place. 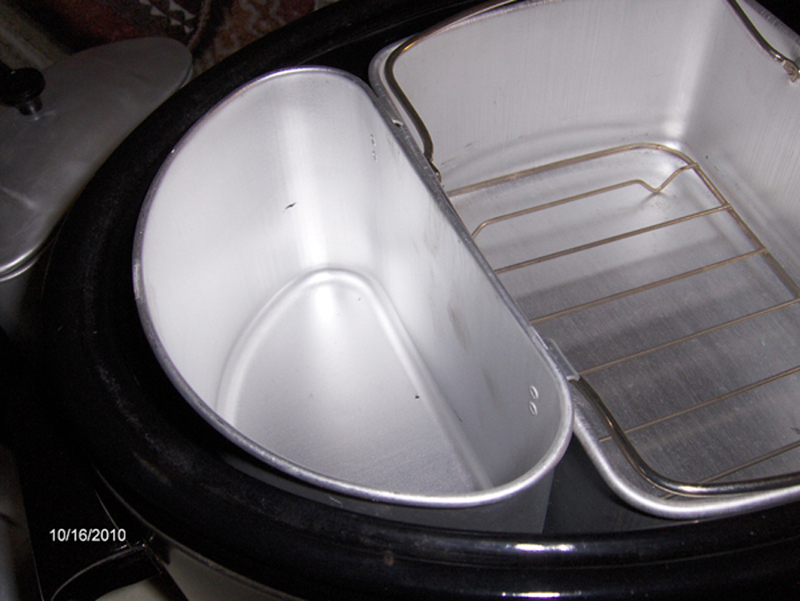 To clean well after roasting, wipe with a damp cloth. 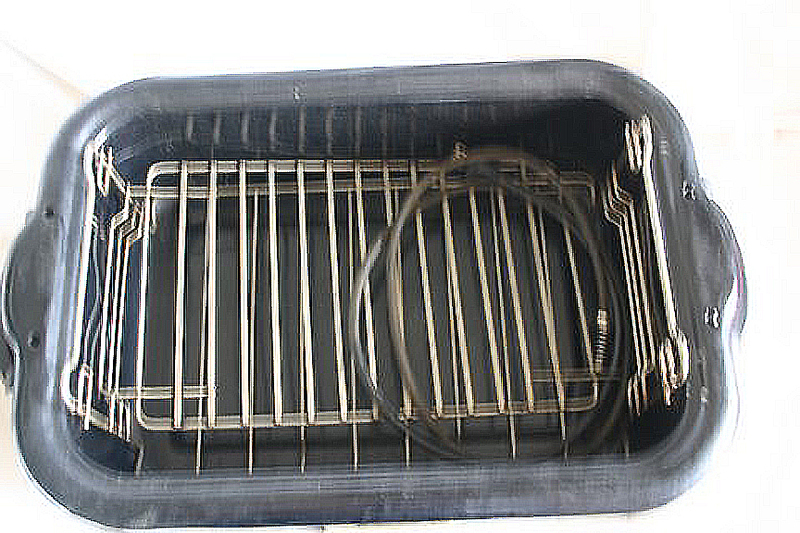 Do not immerse oven-roaster in Water. 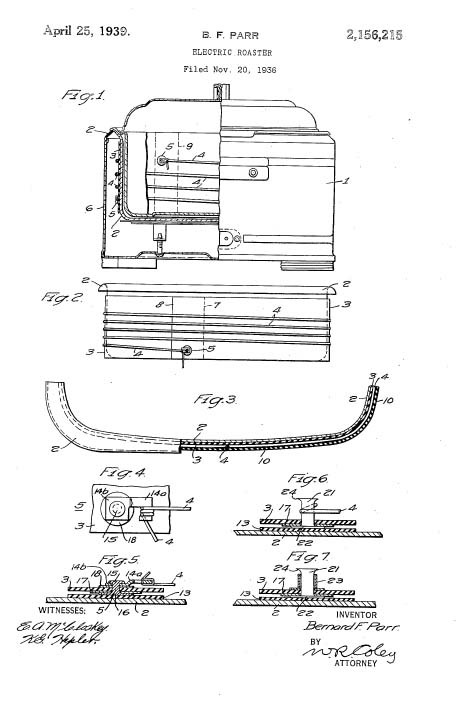 This marvelous gadget was designed in 1938 and changed very little. 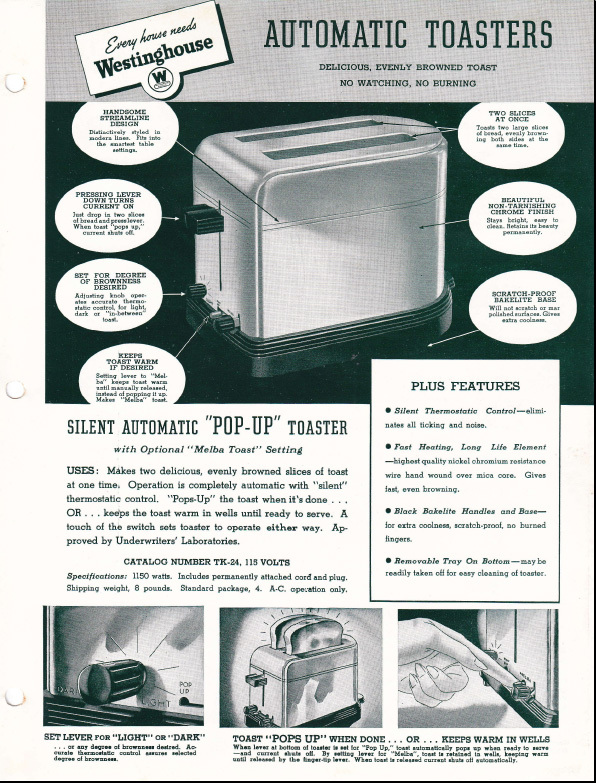 Knockoffs of this appliance (made in China, of course) are still being sold today in a form almost unchanged from 1938. 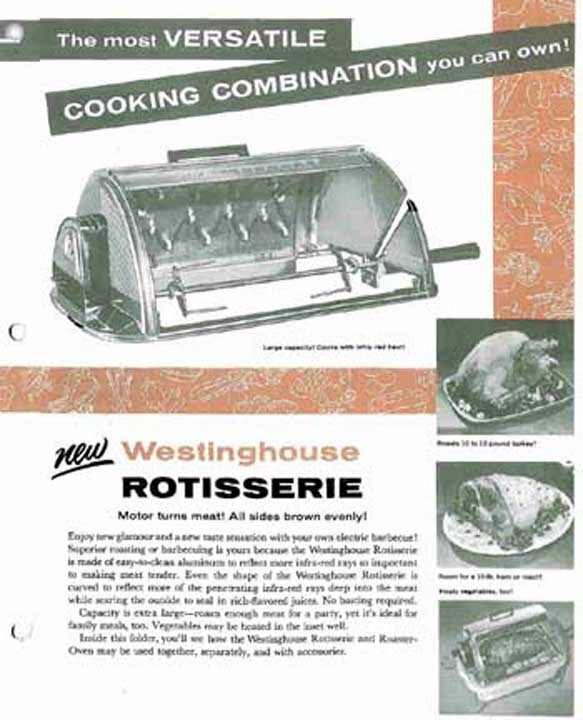 From the beginning, Westinghouse envisioned a Roaster with a Griddle and Rotisserie attachment, as shown below. 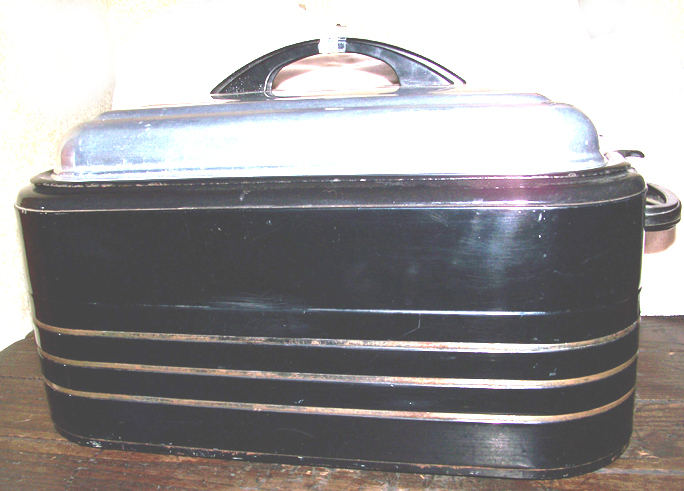 We were successful in restoring the roaster to its original glory. We celebrated with Lasagne --- as I watched the electricity meter speed up into overdrive. Roaster with the Indicator Light "ON"
6-14-2000: The knockout panel in the Forgee stand bothered me for about a year --- I knew that a timer was supposed to go in there, but who ever expected to find the Timer. Then, I was at an antique mall in Manassas, just minding my own business. 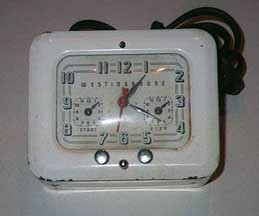 There, sitting on the back of a shelf was something labeled "Westinghouse Electric Clock" --- and then lightning struck! 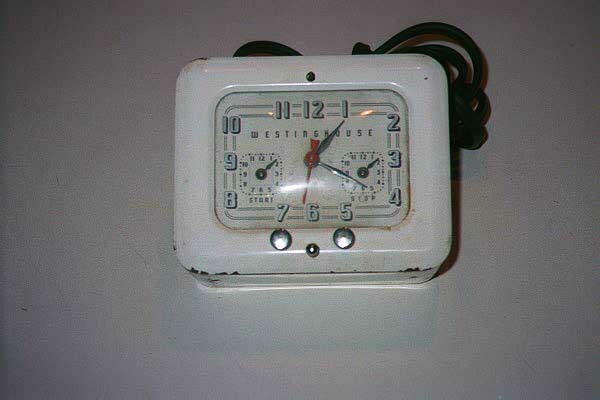 This was the missing timer! Sure enough, when I rushed home, popped out the panel and slid the timer into its proper place. It fits like a glove and works like a charm! Ain't that amazing?? One small note: the knobs that set the time are threaded and when they are turned to their maximum, they come loose. 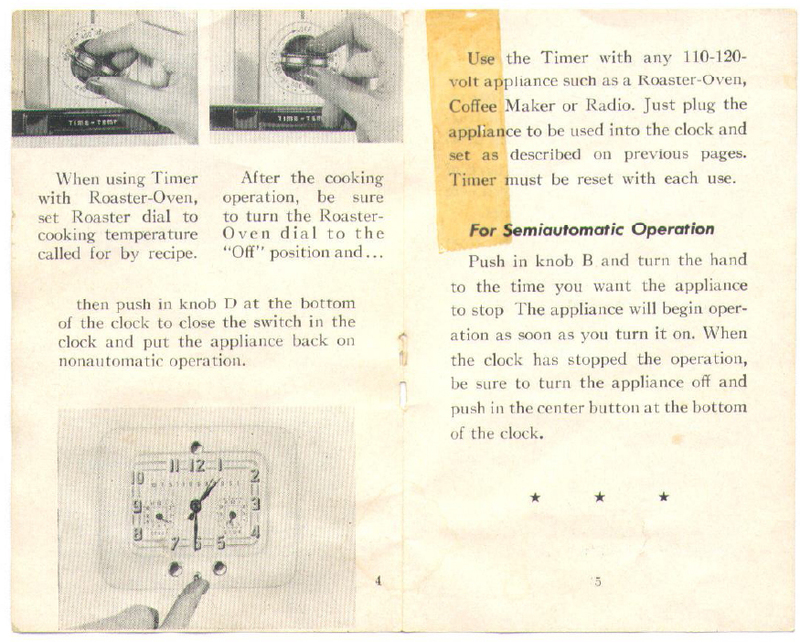 It is very rare to find a timer with all the knobs. Here are the pages (out of order) for you to enlarge and print directly -- or you can Click Here to download a copy as a ".pdf". 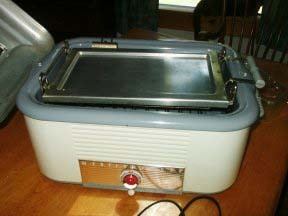 8-11-2000: Thanks to one of my WONDERFUL readers, I was able to obtain a copy of the Instruction Manual for the Roaster. 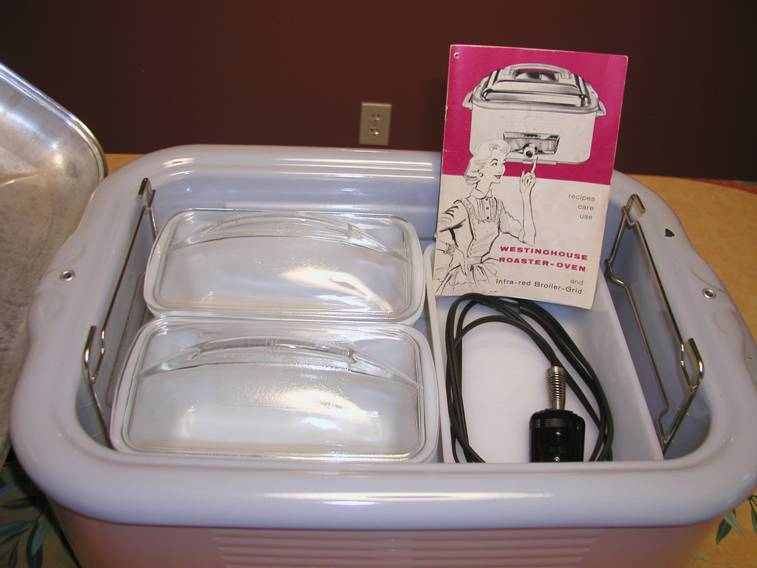 The manual showed pictures of the original baking dishes that came with the roaster. While I was strolling throught an antique mall in Frederick, what should appear but the very same dishes with their very distinctive arch and letter "W" on the top. 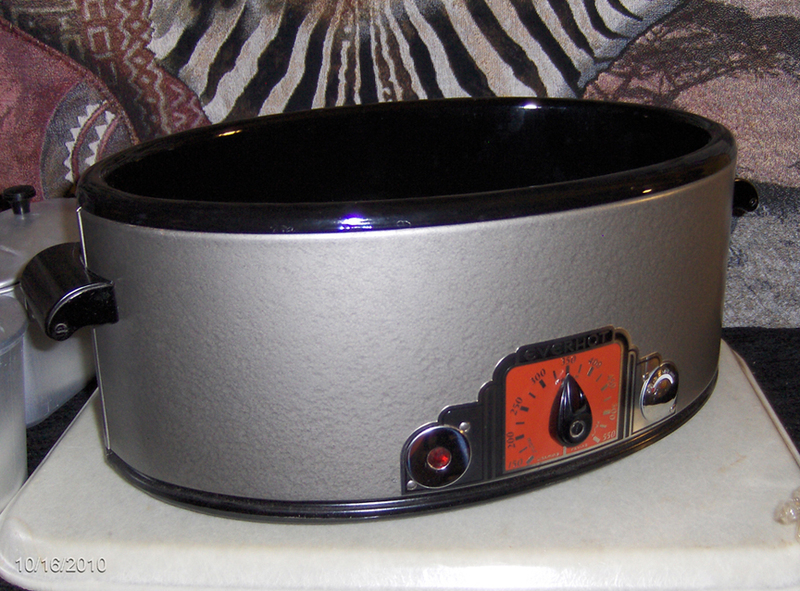 I was thrilled to add yet another touch to the restoration of the Roaster! They are shown in the last photo above. 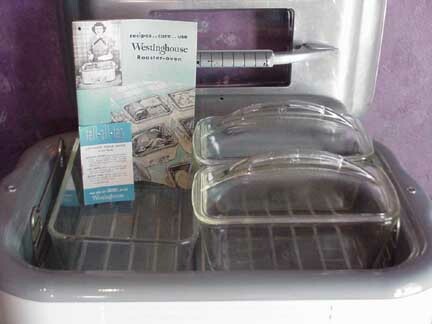 The Baking dishes are the rarest components of the Westinghouse Roaster, and hence the most valuable. 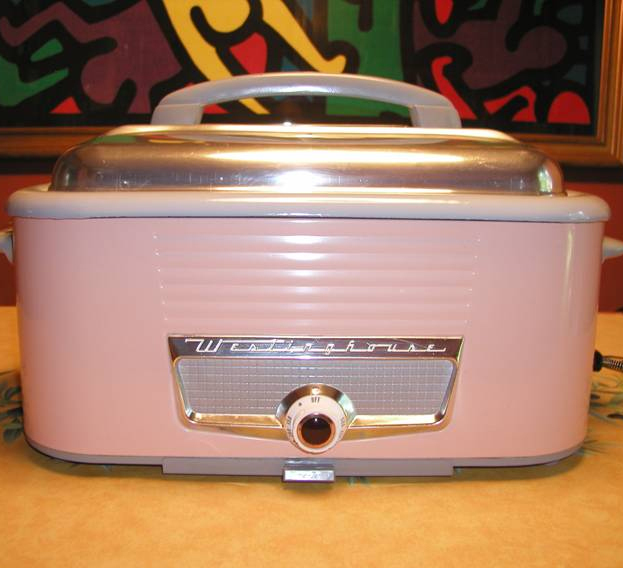 Here is a lovely 1958 Roaster sent in by Cassie. 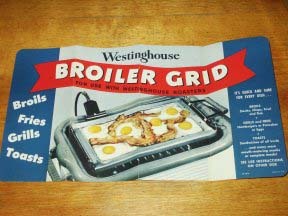 This is in especially good condition AND Cassie has the very rare griddle attachment -- and it looks like the griddle is in its original packaging. 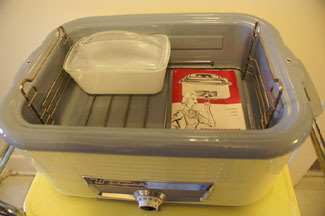 It also looks like Cassie has all the baking dishes. She has "posed" her Roaster to show how the Lid Support works. 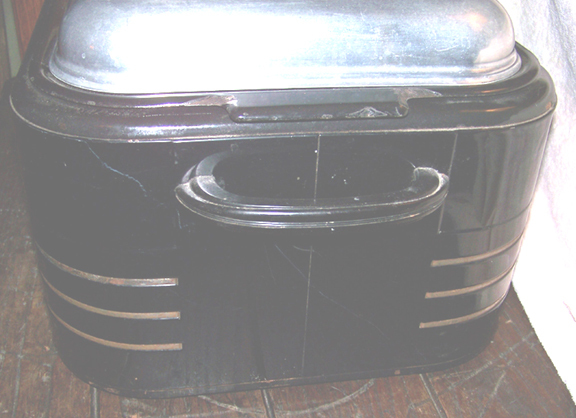 When the roaster is in use, moisture condenses on the inside of the lid. If you need to stir the contents or add things, you would make a big puddle if you set the lid down. 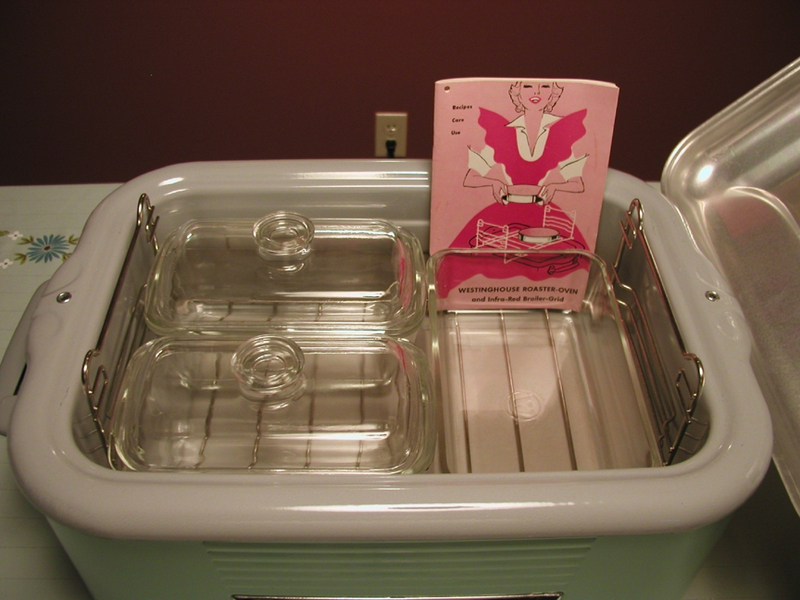 The lid support allows you to rest the lid (upside down) while you deal with the food. "... I commend you on your web site and the information that is available. One you your bolggers said that they lived close to Mansfield and was going to see what was at the library on Westinghouse. Unfortunately they hardly have anything. I have been collecting Mansfield factory items for the past 13 years. 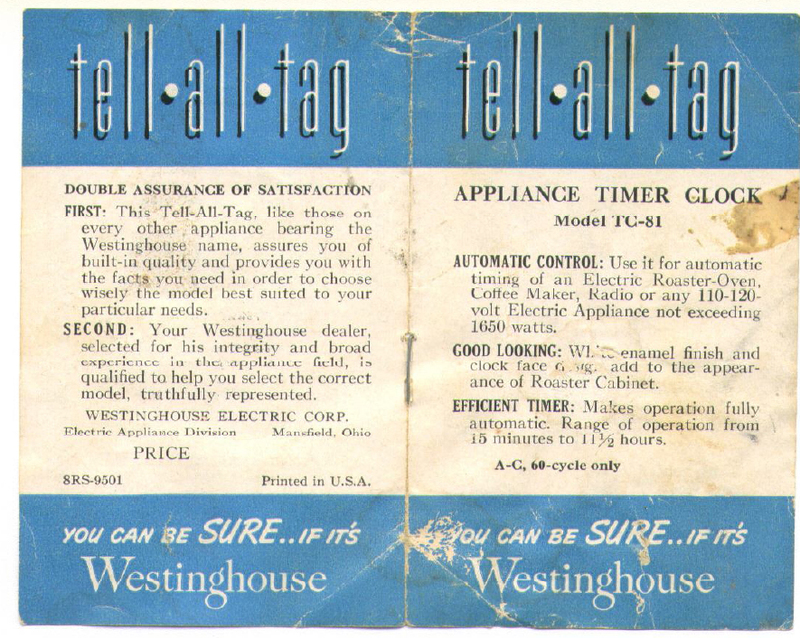 Between the Museum and my personal collections we have amassed a great deal of material on Tappan, Dominion Electric and of course Westinghouse. 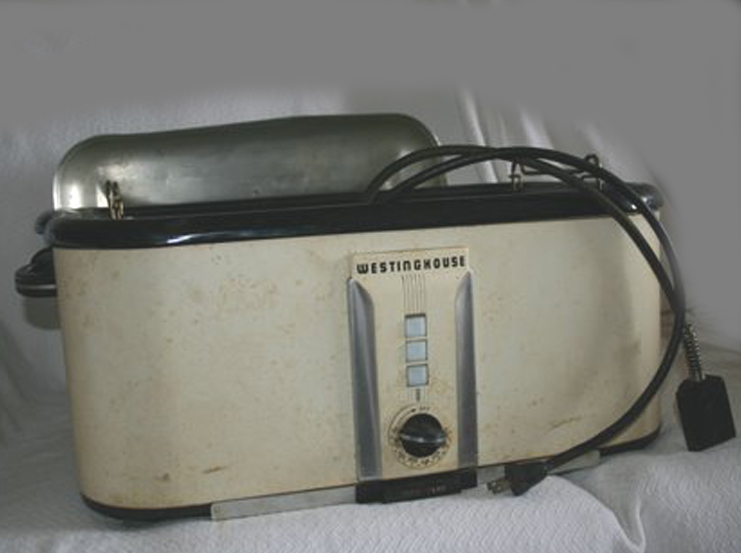 "...I also have the original Westinghouse Robot "ELEKTRO", that was made here in Mansfield for the 1939-40 New York World's Fair. 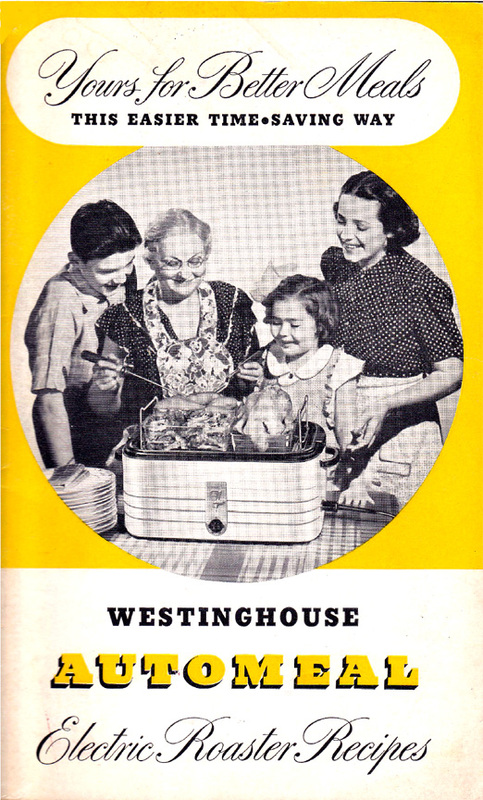 I just purchased that last remaining archive files of Westinghouse which date from the 1930's through the 1960's. 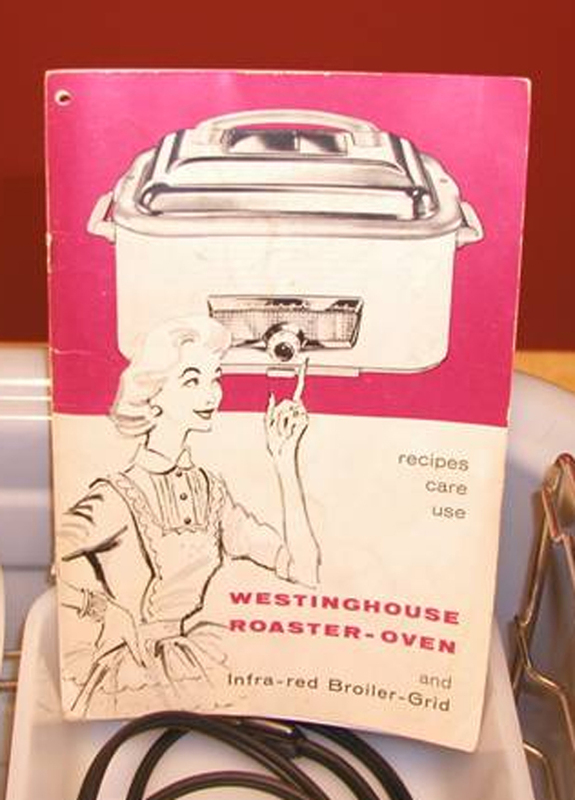 "...I also bought with the file collection a Westinghouse Roaster. 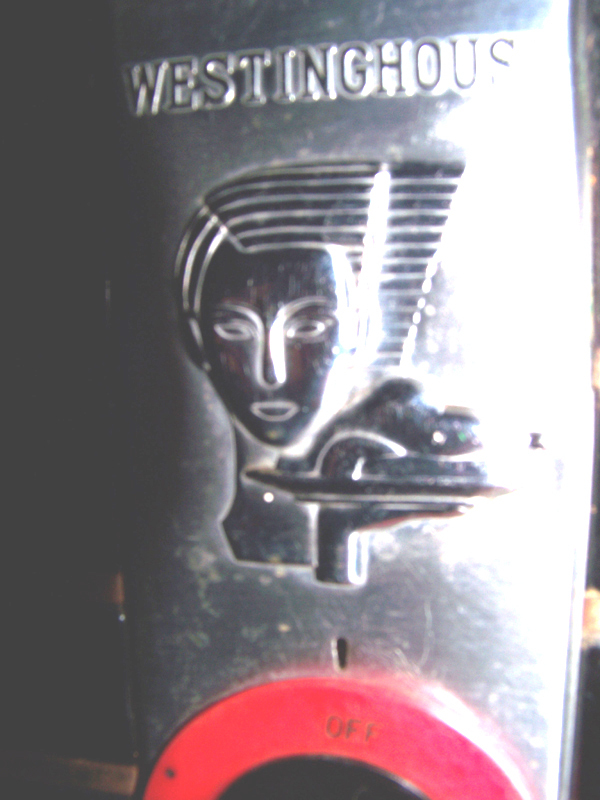 It is high deco with a black and silver stripped exterior and a beautiful silhouette of a woman. 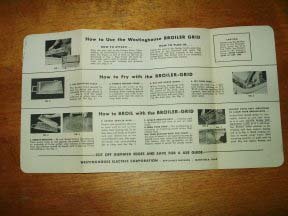 (I have never seen a woman and turkey on a platter on any other roaster) It also included the original cords and the broiler griddle and instruction manuals. 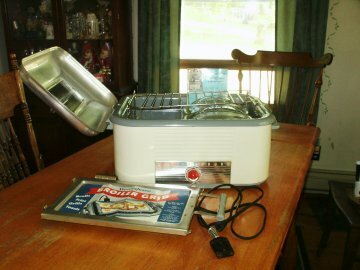 It is called the Deluxe Adjust-O-Matic Roaster Grill. If you and your readers would be interested in photos and other material I can over time copy them and send them to you. I hope that you enjoy them. . ..."
Our devoted Consulting Roaster Guru, Roberta has these observations about the Automeal model. "... 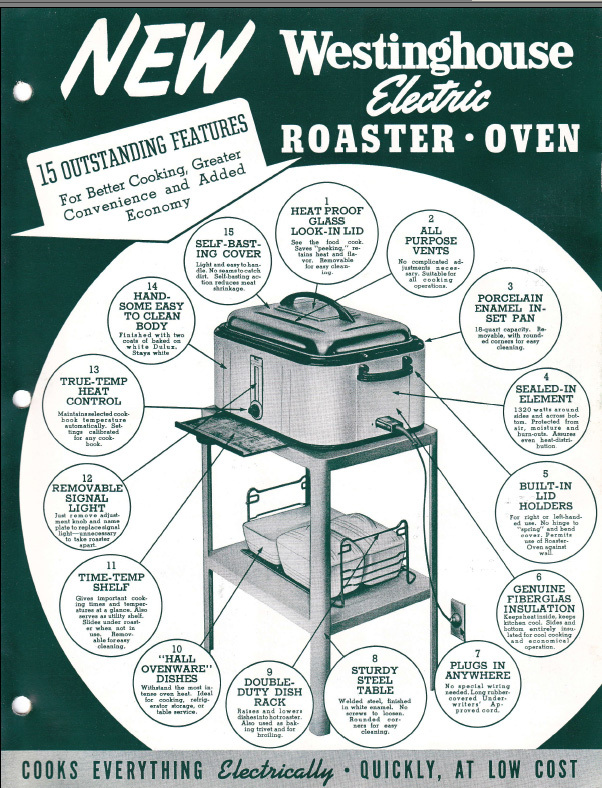 In the 1939 Automeal manual, the testimonials are "Actual statements by women users who have owned Westinghouse Electric Roasters for one year or more." 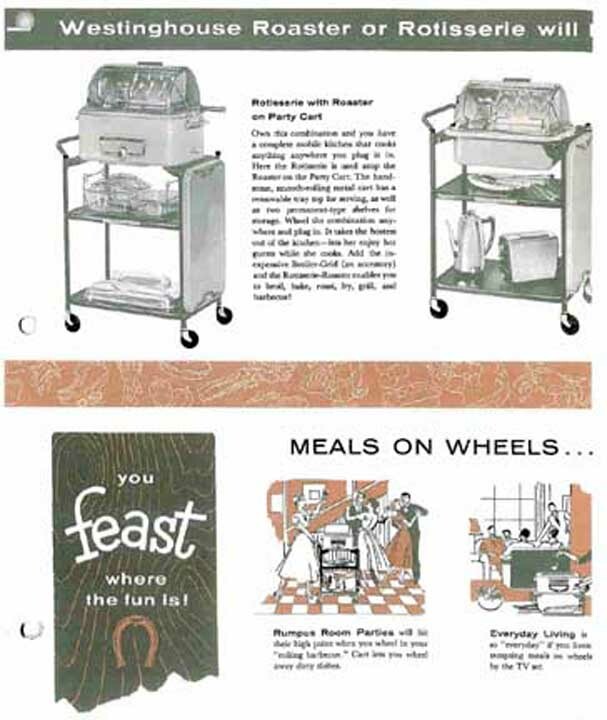 Since some of them specifically use the word "Automeal" and there is no mention of that name in the 1936 manual, it seems a safe bet that this model was around at least since 1938....there were two options for the dish set: either colored or clear glass. 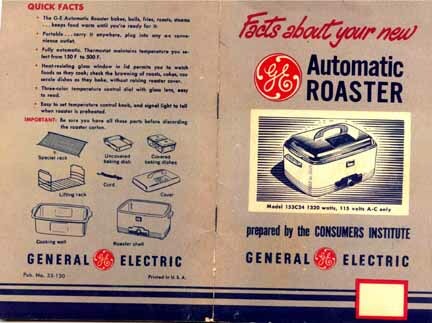 ..."
Roberta has been kind enough to scan the manual for the Automeal roaster, and you may find it in the Free Downloads section. 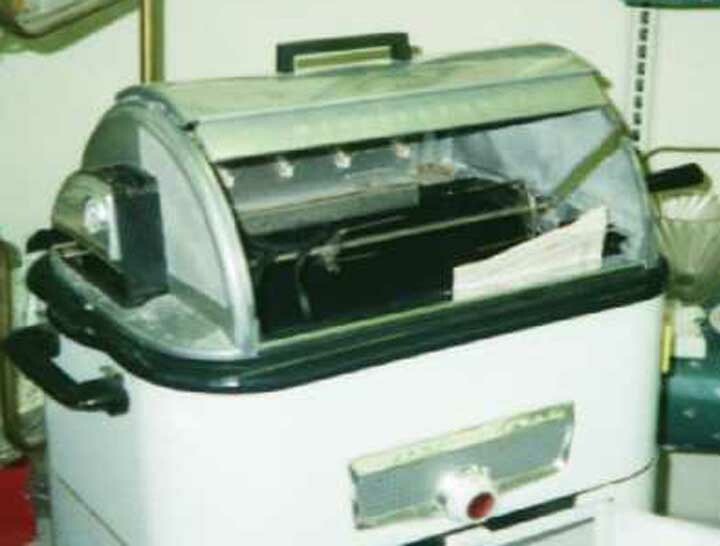 November 9, 2001: Here is a postwar RO-81 model roaster (1942-1948. 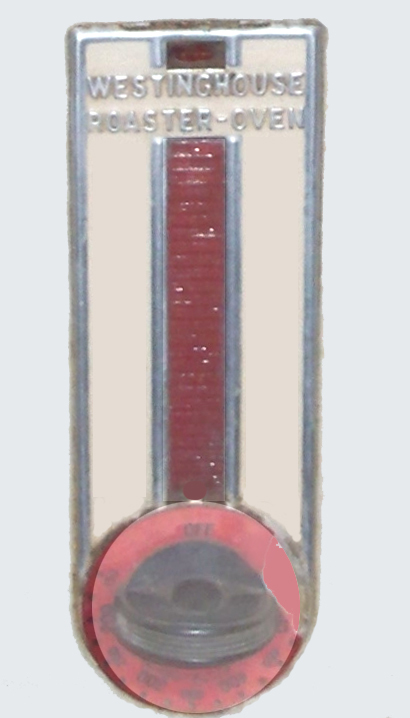 It is the same thing inside, but it has some color and three lights which show whether the thing is on and whether it has reached the desired temperature. Anyway...just thought you might liketa see it. If you have any leads on an original manual, cookbooks, any accessories....I would love to hear from you! Thanks and here's to roaster cookin'! 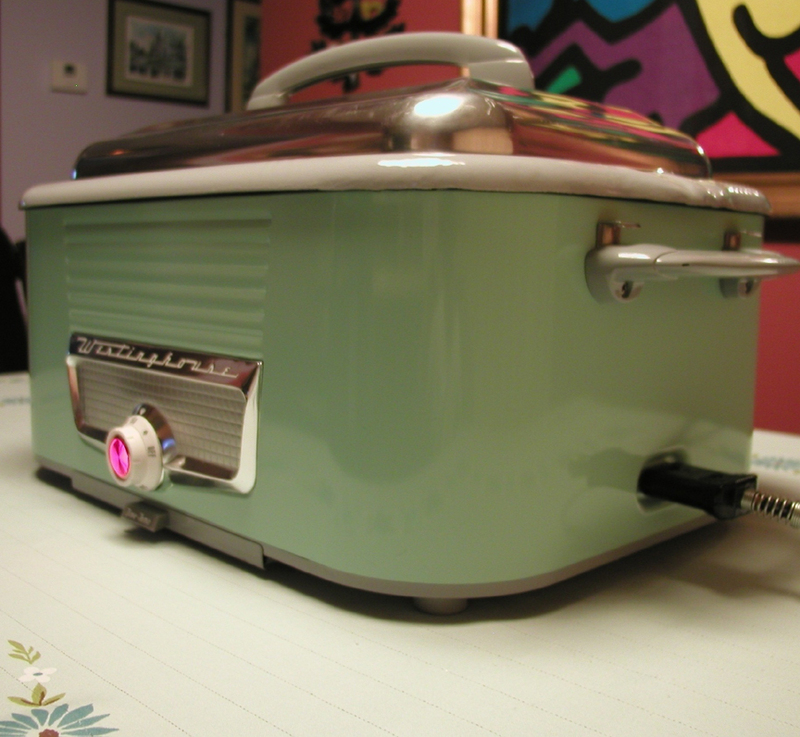 "A few years ago I inherited a roaster from an elderly aunt who passed away. 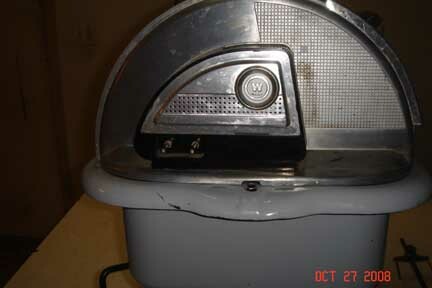 While seaching the web, I found your site and am taking you up on your request to send pictures of roasters! Do you have any idea what year this model is? 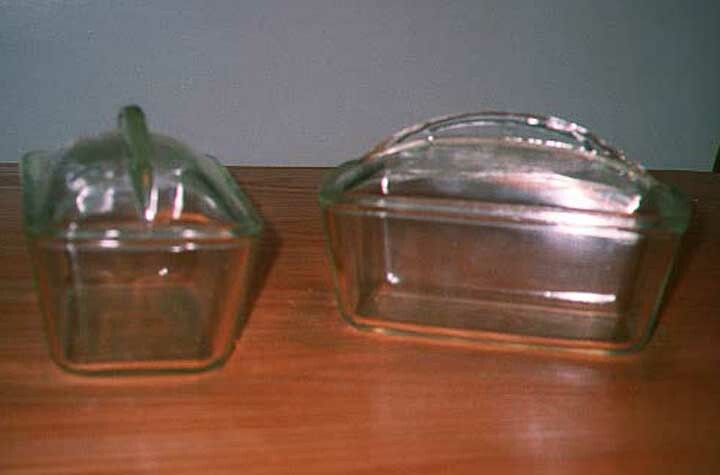 It has the glass insert in the top of the lid. " 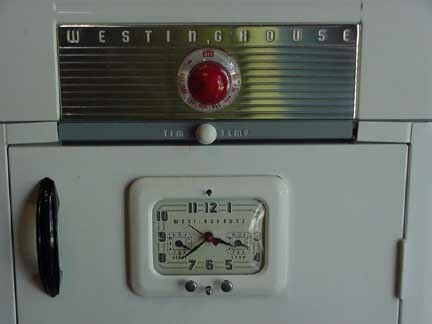 We came across your site doing some research on Westinghouse roasters.� We purchased our roaster on July 21, 2006 at a garage sale for $25.00!� I am sending along several pictures of the roaster.� It came complete cabinet with a clock timer, the dishes (with the arched tops), the booklet with recipes, and the small booklet for the timer!��The timer is only missing one of the small knobs.� It is in immaculate condition! 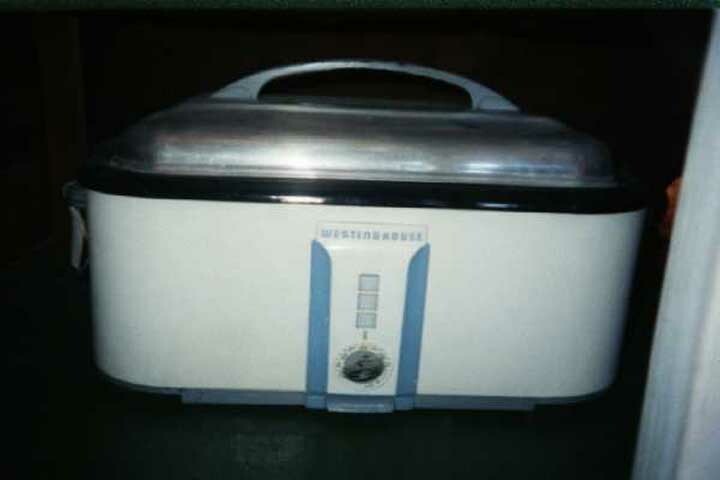 ...The lady who was selling it said that she used it for Thanksgiving turkeys just a few times and it worked wonderfully. ...Incidentally, Mansfield, Ohio is about a 25 minute drive from where we live in Bucyrus.� We are in Mansfield at least 2-3 times a week.� My husband was saying that there used to be a Westinghouse plant in the town.� It would be cool to go over and check at their library in the local history section to see just where it was located! Thanks for all the great information on the roasters! Indeed, Greg and Barb got a FANTASTIC DEAL on this complete Model RO-91! 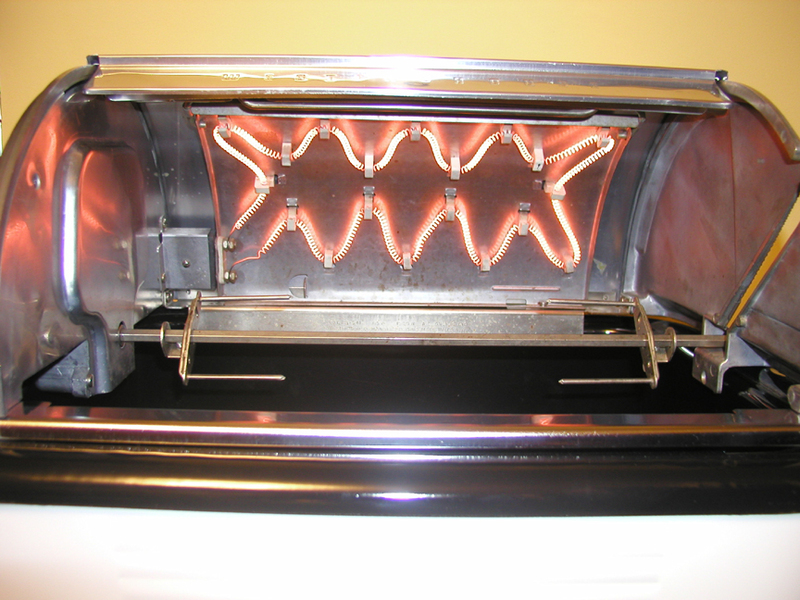 This roaster, dating from the early 1950s is really in good condition. 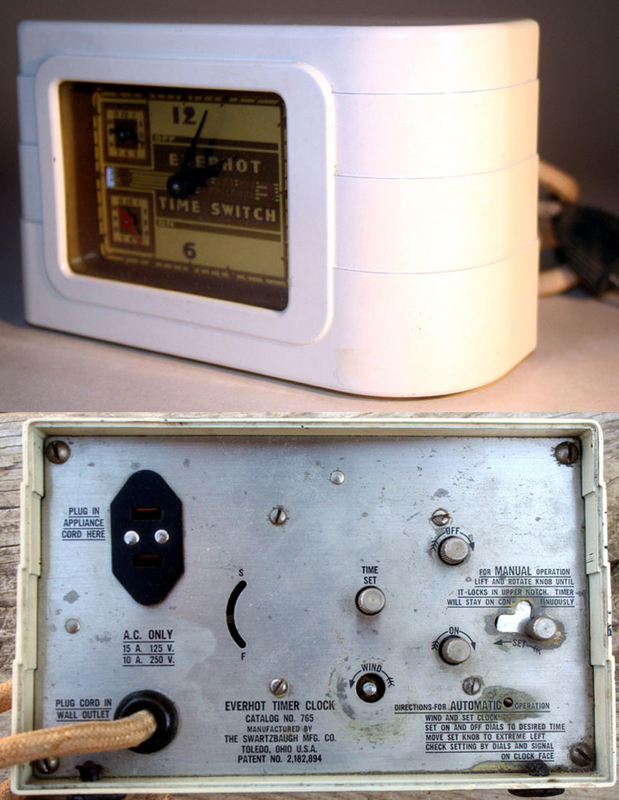 There is areason that the timer knob is missing --when you set the time back, you unscrew the knob. After a while, the knob becomes loose and falls off. "... 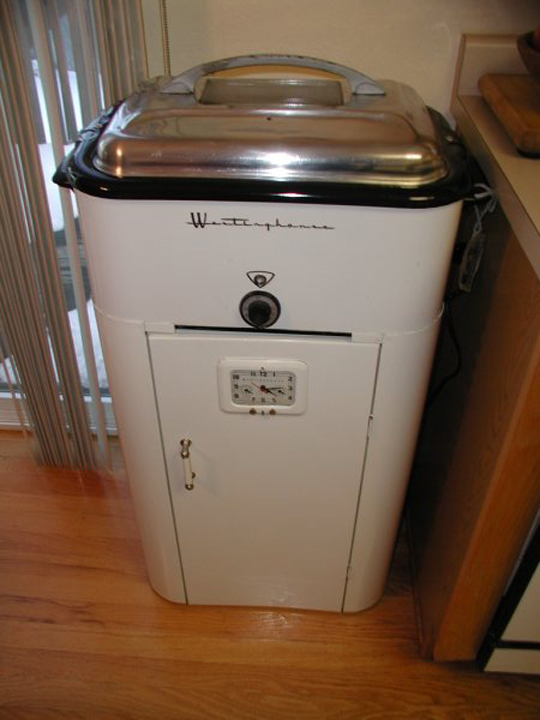 Still in use at least once a week ..."
"... I�ve enjoyed your site for years now and have admired the devoting to the Westinghouse Roaster. I�m a long time fan of the device and have two stunning examples that see regular use. 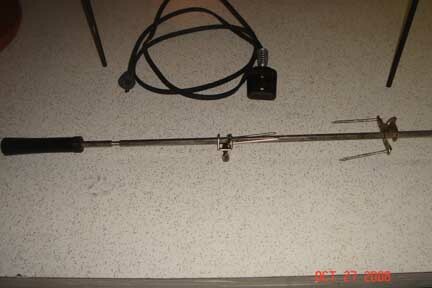 I�ve attached several pictures of the uber rare Rotisserie attachment I recently acquired. I hope they make it to posting on your site. Little is seen about them anywhere. I plan on using it Sunday. 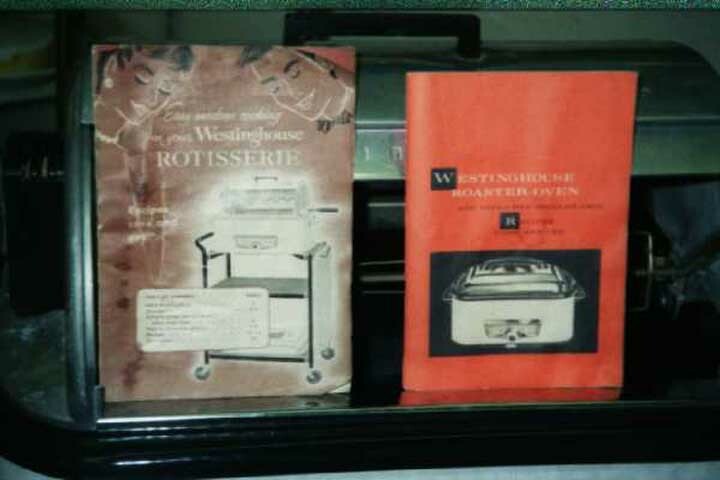 The pictures were taken yesterday evening after a complete dismantling and thorough cleaning, tweaking and lubing ..."
"We were just looking for information about my grandfather's Westinghouse Roaster Oven and came upon your site. 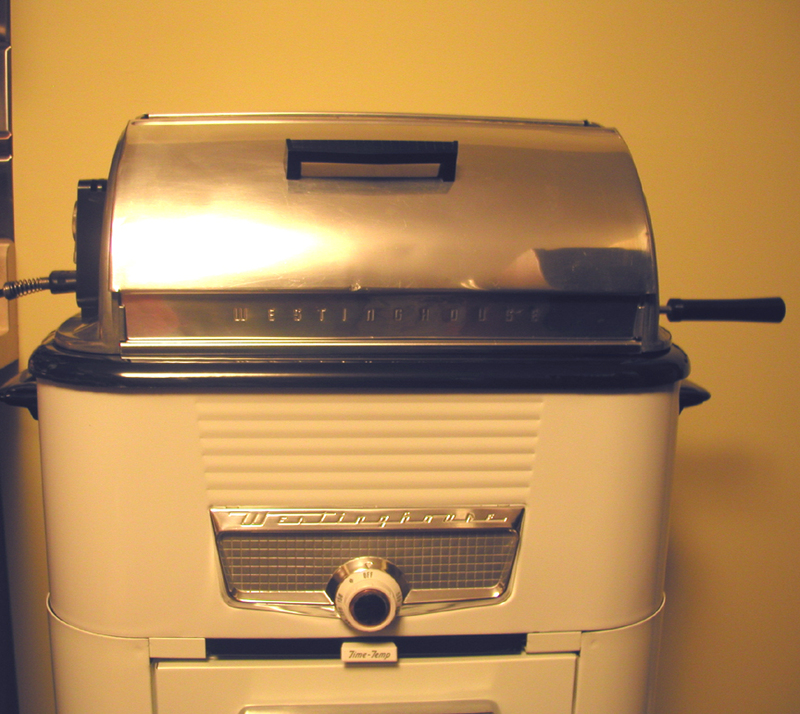 We knew the roaster has been in the family for years, but were wondering how old it was. 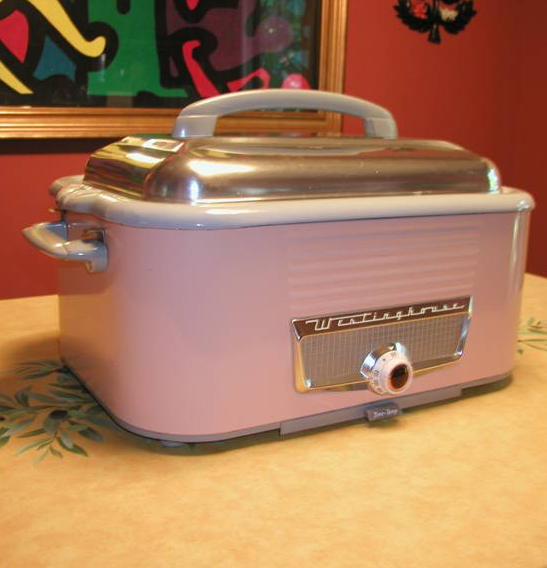 The roasters were indeed Pink. 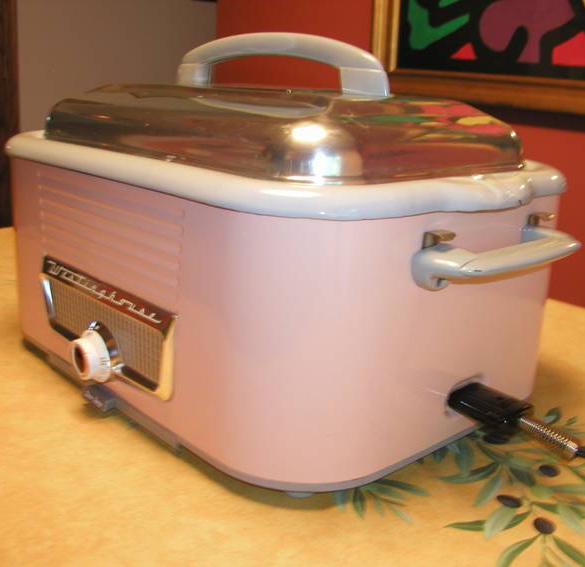 My grandfather's has a broken handle, but it is still pink and gray, and otherwise looks great. Thanks for your site. " 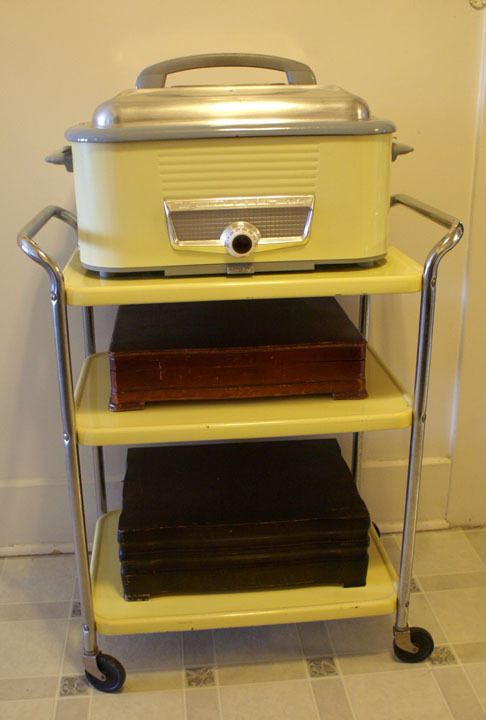 Our reader Cynthia (from California) sent us these lovely photos of her yellow roaster. She says: "... 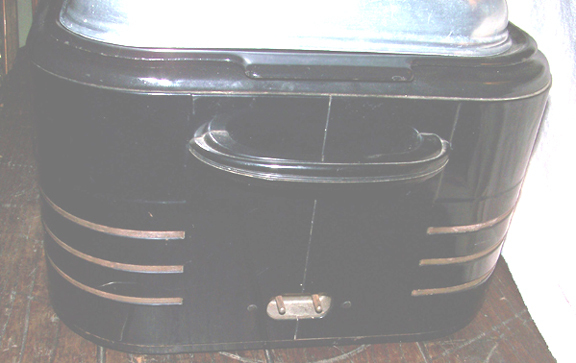 I intend to fully use the roaster and all its accessories, not just look at them as vintage decorations ...."
"... 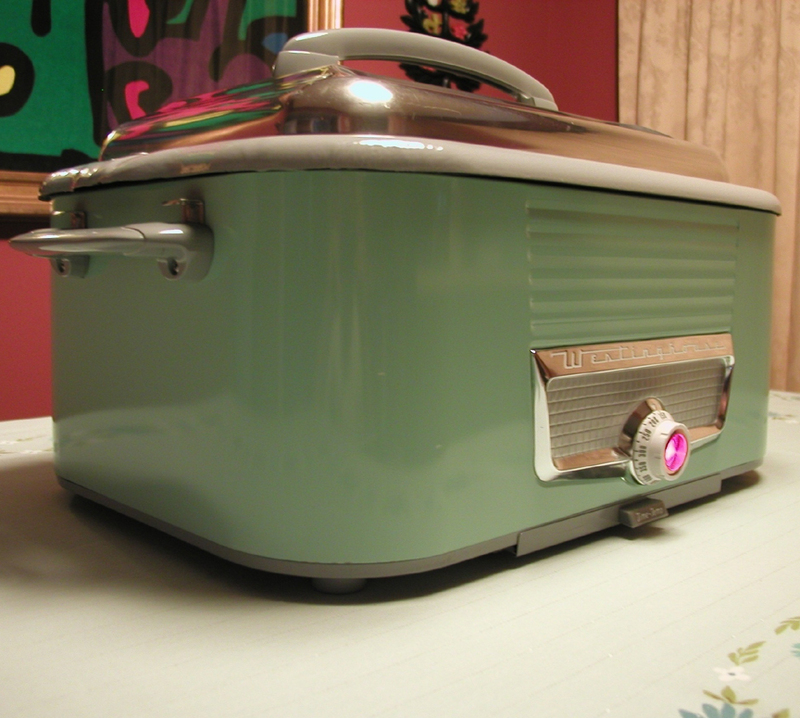 I thought you might enjoy pictures of this stunning example of the Roaster in one of the 'designer' colors. 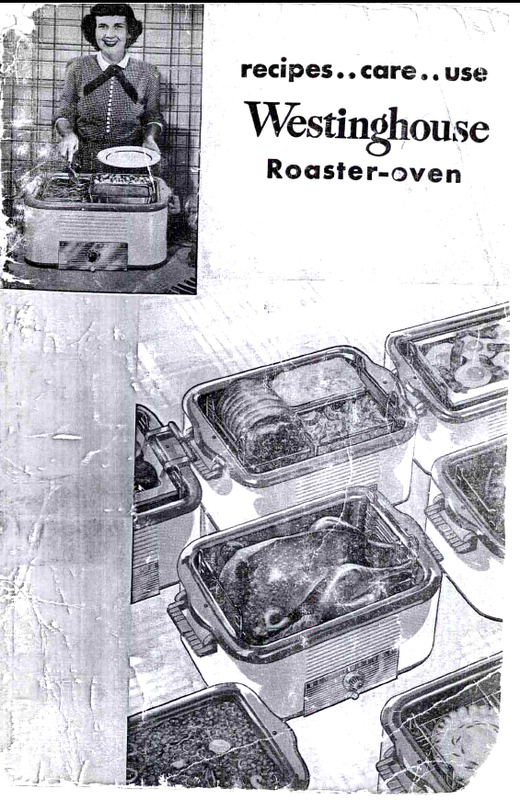 Thanks for publishing the previous rotisserie photos I�ve sent in ..."
"... There�s a date noted on the manual of �July 10th, 1959� in a woman�s writing style. 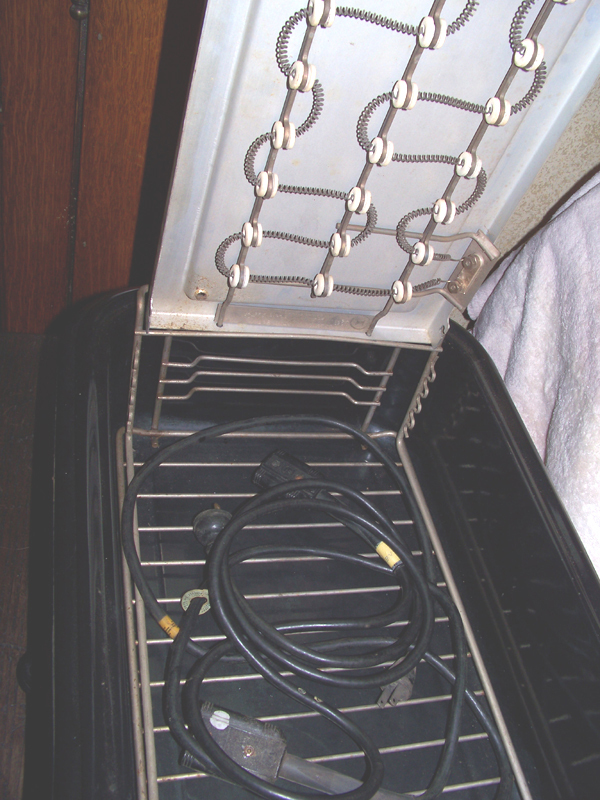 Sadly, someone cooked something in it without the inset pan in so the inside of the Roaster has been scrubbed. 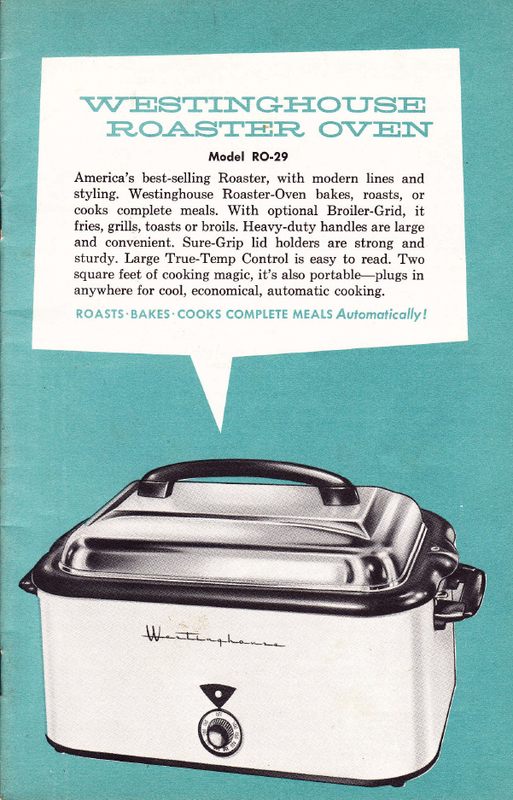 Not an uncommon fate as for in the earlier Roasters cookbooks, they actually spoke of how to do that for large birds. 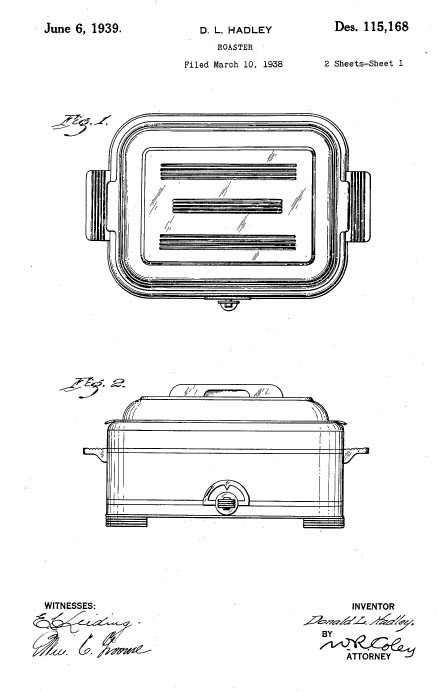 The inset pan would then be inverted and used as the top cover. 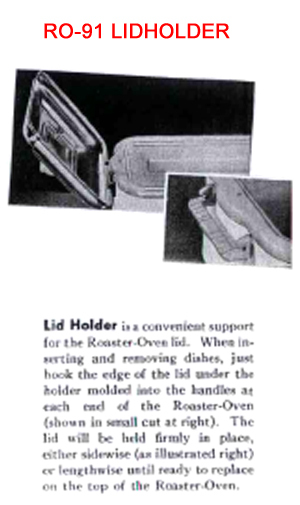 It would rest on pins that stuck out of the roasters base. I had two of the three dishes that match what it originally came with, none were with it at auction. It�d be really sharp were it not for that and the grey inset pan itself having many chips. This one runs about 25 degrees over (hotter) than what it�s set at. 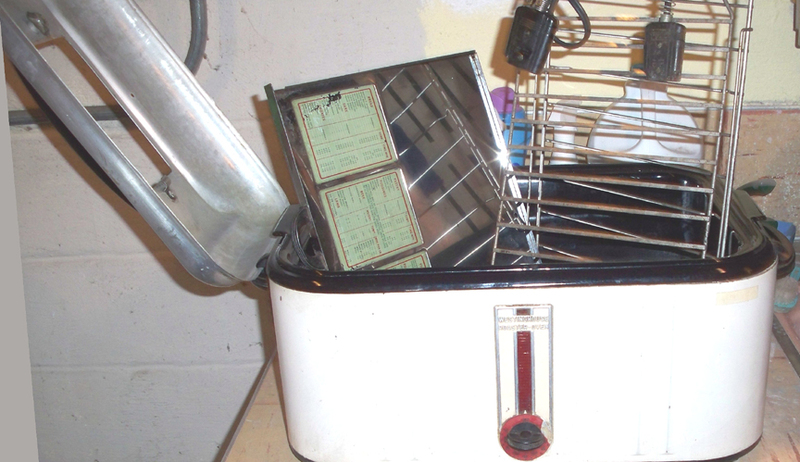 I�m going to tinker with my scrap (parts) oven for some sort of calibration ability. 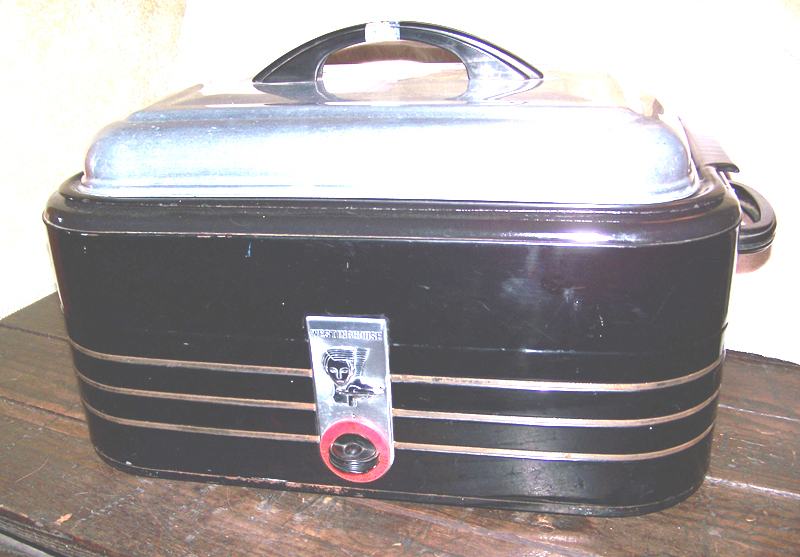 I had to hand paint back in the �Time-Temp� stencil on the pull out drawer ..."
Here is a lovely 1936-1938 "Jubilee" Roaster sent in by the newest addition to our "Roaster Roster", the celebrated 40s Phil of Indiana. 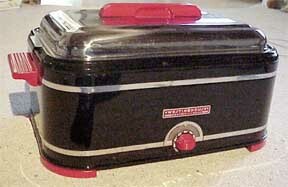 This is the earliest roaster that I have seen and those red handles are just awesome! Roaster fans all over the world are drooling, Phil! 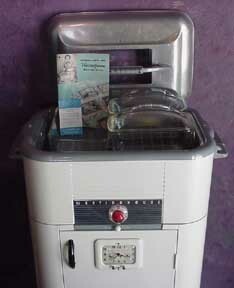 In March, 2011, Roberta found a Model RRA-4, which is the downscale version of the "Jubilee". "... 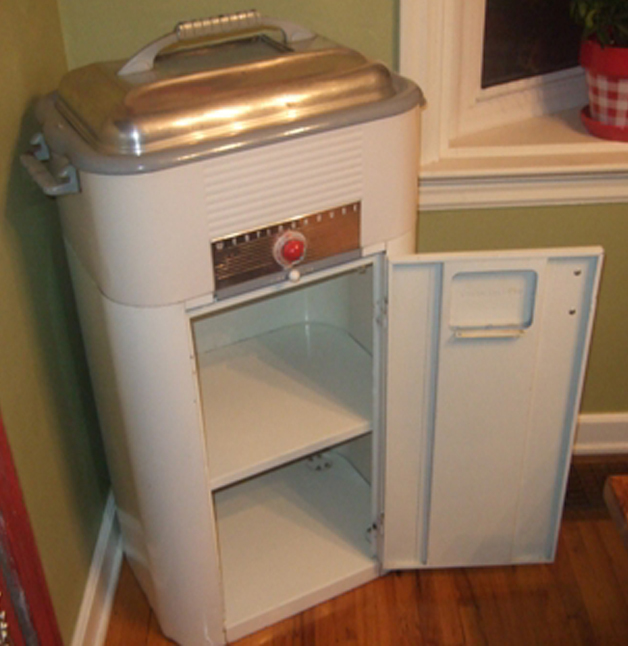 Thought you might like to see this interesting little piece I came across...I think it's basically the same as the one with red handles that 40's Phil has, except that the handles aren't red. 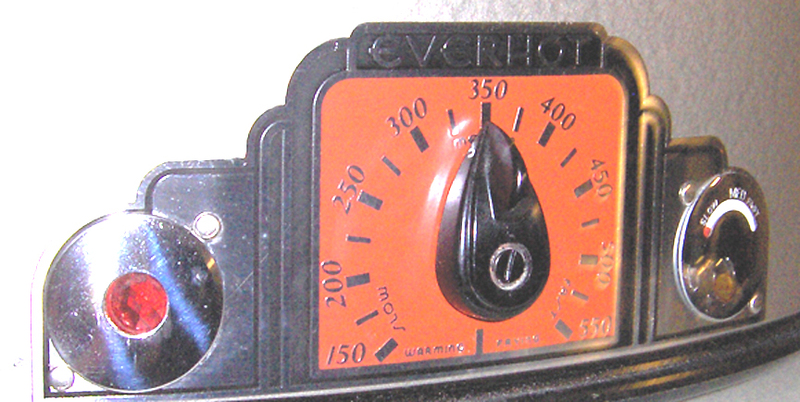 (And it's a bit battered...) The Model Number is RRA-4, and it's only 1150 watts. 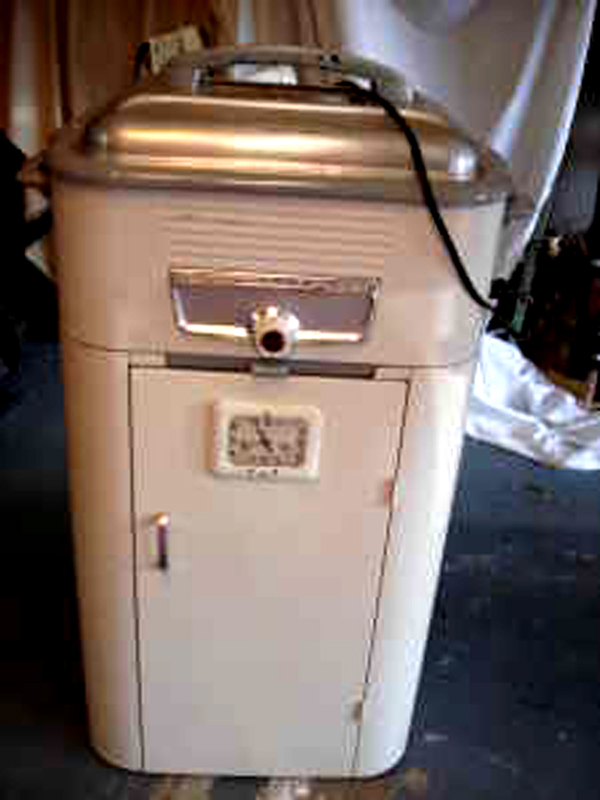 Also a little smaller than the later Roasters, possibly 16 quart like the Westinghouse "Standard" Electric Roaster. What's that? You say you didn't know there was a 16-quart Standard model? Neither did I, but I've founds some interesting documentation (See below). Another antiquated feature on this oldie is that the feet and handles are wood. 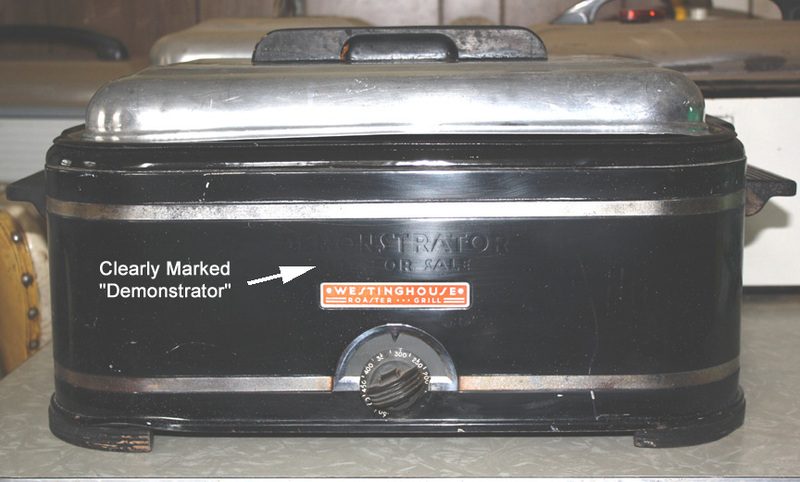 You can see, stamped right into the sheet metal on the front, that this particular one was a "Demonstrator" and was not intended for sale, so I'm not sure if the "real" ones had wood or plastic (bakelite?) handles. (Phil's red-handled beauty certainly looks to have plastic handles and feet, though I suppose that could just be a fancy paint job.) Sadly, this one doesn't seem to power up; I didn't leave it plugged in long, but I didn't detect any heat. Could be that, as a Demonstrator, it doesn't have all the internal workings. Or some of those workings aren't. Working, that is. Or the cord is bad, and, since the pin spacing is closer than on the other Roasters, I haven't got another cord to try it with. I may have to do an autopsy to find out what's going on. Regardless, I'm happy with it - makes a great showpiece, and I certainly have enough working Roasters for all my Roasting needs. 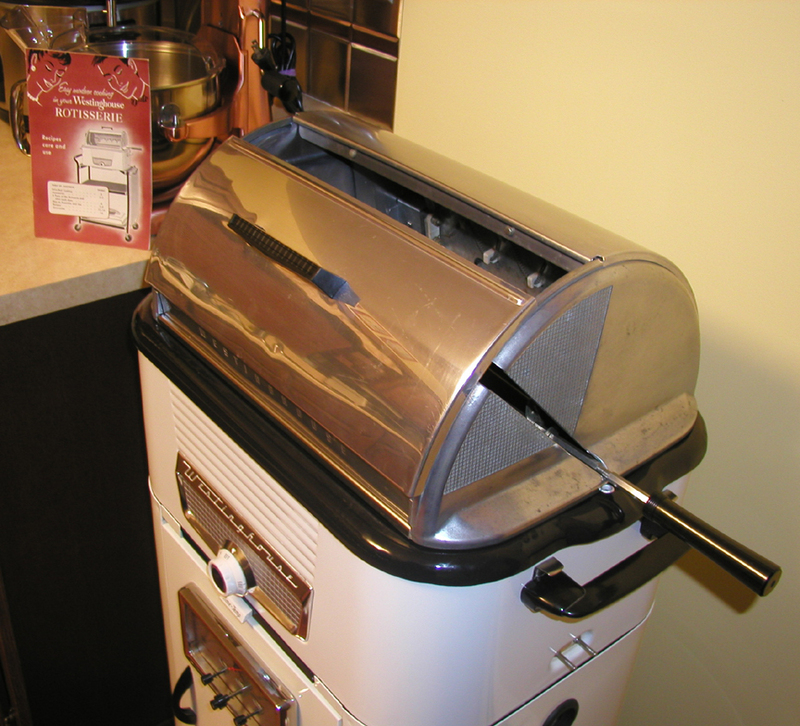 ..."
Roberta was kind enough to scan the appliance brochure that came with the roaster and we now make it available for free download. 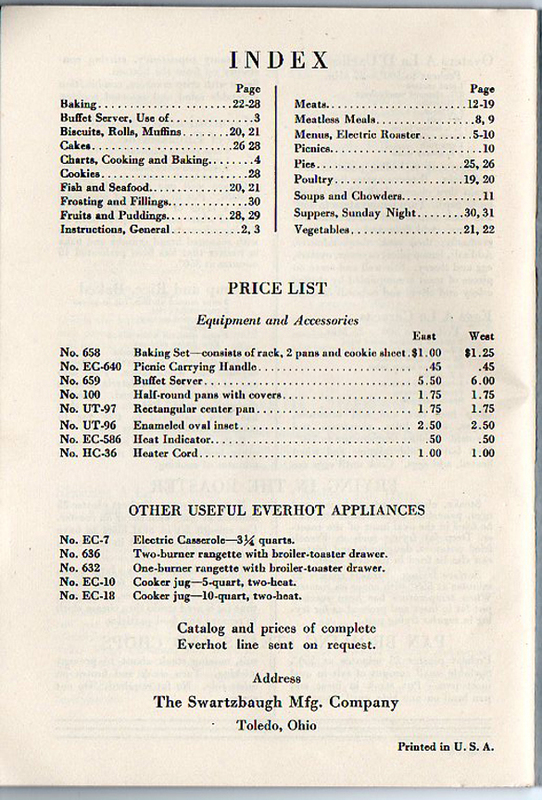 You will LOVE the Price List! 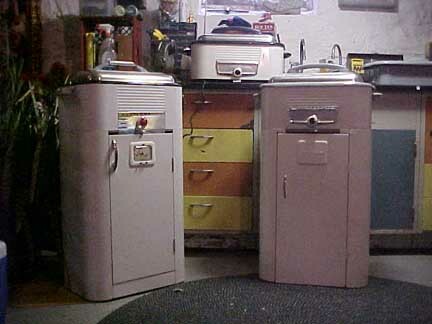 Here is a photo from one of our readers who has THREE roasters! This home really appreciates the Roaster! Russ wants some help in dating this Roaster. This is a Model RO-81, distinguished by the row of three square buttons. They were sold during the period 1945-1948. 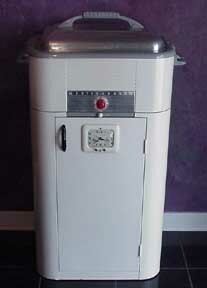 Since appliances were not made during WWII, it is conceivable that this could have been designed in the 1930s. Here is a nice letter from one of our readers who didn't realize what he had. 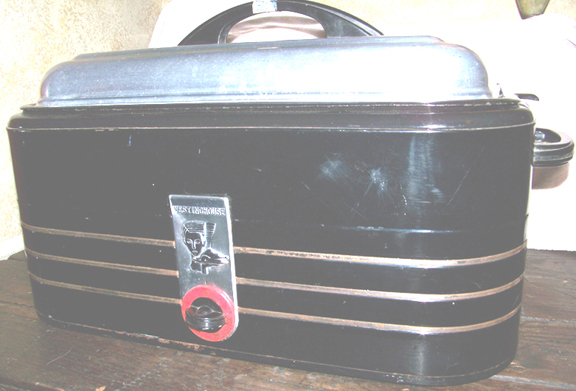 He was about to throw away a fairly rare 1940s roaster that may even be older than the one Russ has. 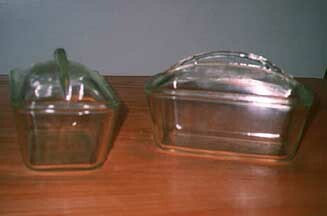 "... was really looking for the glass that was broken on thanksgiving day...Did not realize it was so old!We did do a 20 pound turkey in it , and was cleaning up when the glass fell out and broke into 1000 pieces.... Is it worth anything to anybody,or do I put it out for the trash ..."
All he has to do is buy a less rare 1950s roaster and switch out the lid. We got these photos from our reader Lisa. She'd like some help in placing a date on the Roaster. 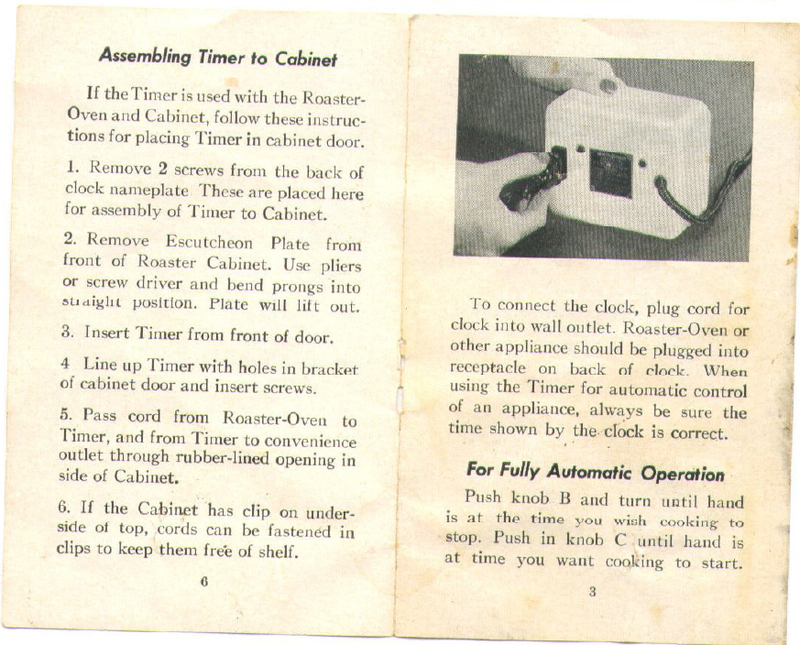 This is a 1940 RO-29.You are lucky to have the timer!! "... Howdy! I am so excited to show off my fabulous roaster/stand....this was purchased today for $15 at a local yard sale, and it I think it will be one of my favorite treasures yet. I can't believe the shape it's in...virtually no wear at all. The man who sold it to me said he remembers every year of his childhood waking up to a turkey on baking in it on Christmas morning. It is in working order and I can't wait to try it out. 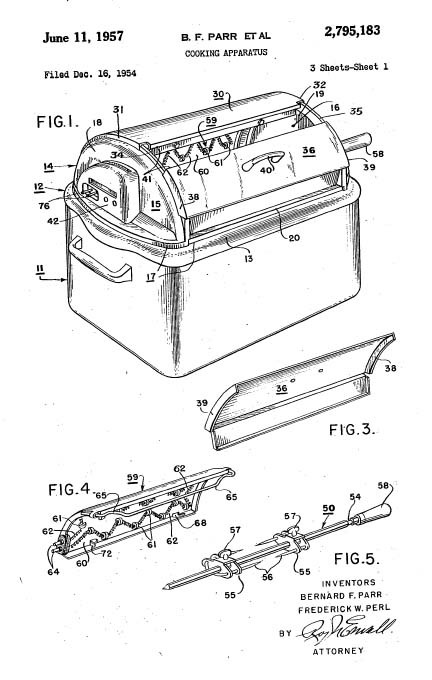 ..."
Parts for a Roaster were an integral part of the detonator mechanism for Fat Boy, the Nagasaki bomb. Of course, that is not true... However, a reader sent us this photograph of an actual kitchen in the Luxury (?) apartments (Sundt Block) of the Los Alamos project (Site Y) in about 1944. We are told that the Army furnished the scientists with wood stoves. 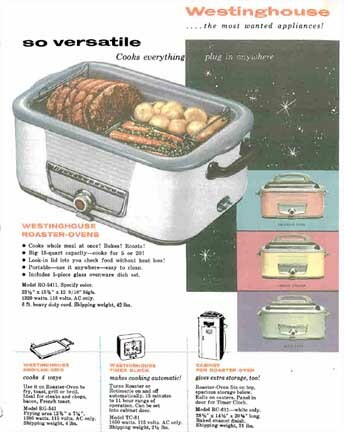 Note that the family has augmented its cooking capacity by adding a Roaster. 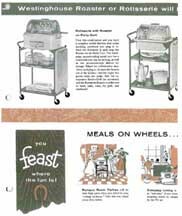 I am very greatly indebted to my reader Roberta, who painstakingly scanned several manuals and brochures. I am very pleased to make these available to my other readers, free of charge. Free Manuals Available to you! We have arranged these manuals in easy-to-download 8MB pieces. 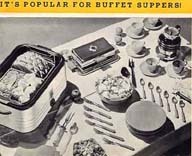 I'm sure that you will have a fun time looking at the pictures and trying the recipes. 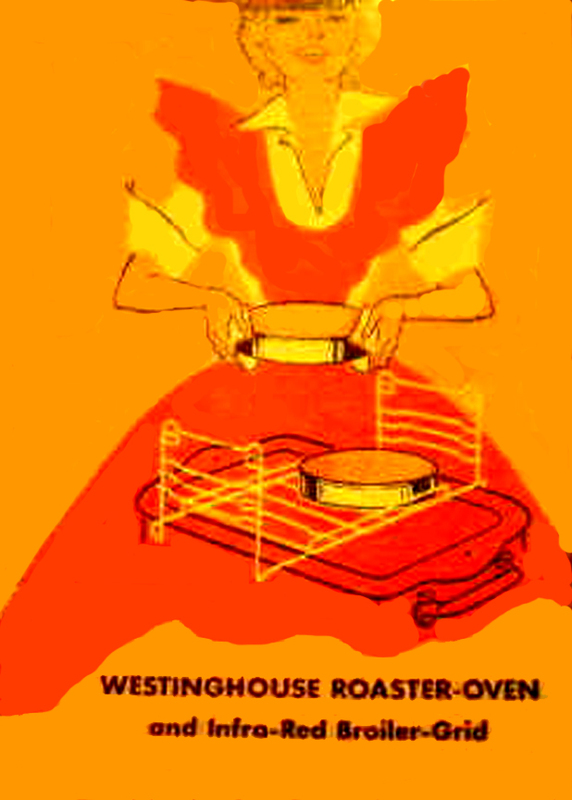 Westinghouse Golden Jubilee Roaster: The Westinghouse Company was founded in 1886, and its Golden Jubilee (50th Anniversary) would have been in 1936. 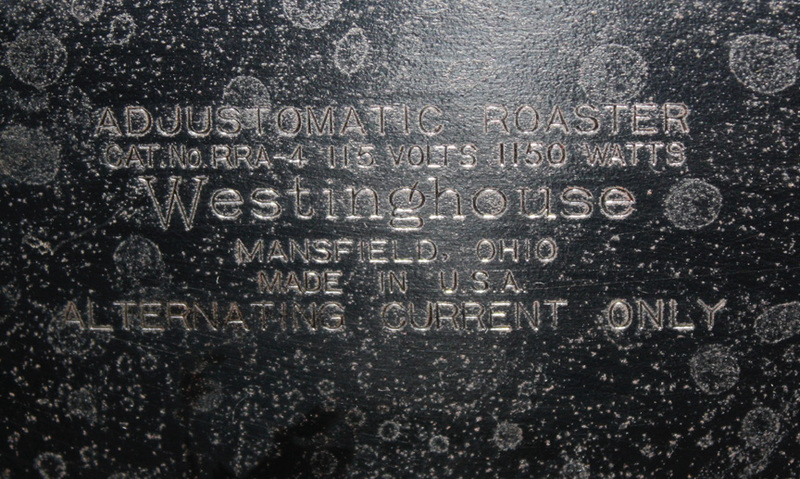 Westinghouse RRA-94 Roaster: This is probably from before WW2, featuring an appropriate "grandmother figure stereotype"
Westinghouse Roaster RO-29: this roaster and manual dates from the 1940s. 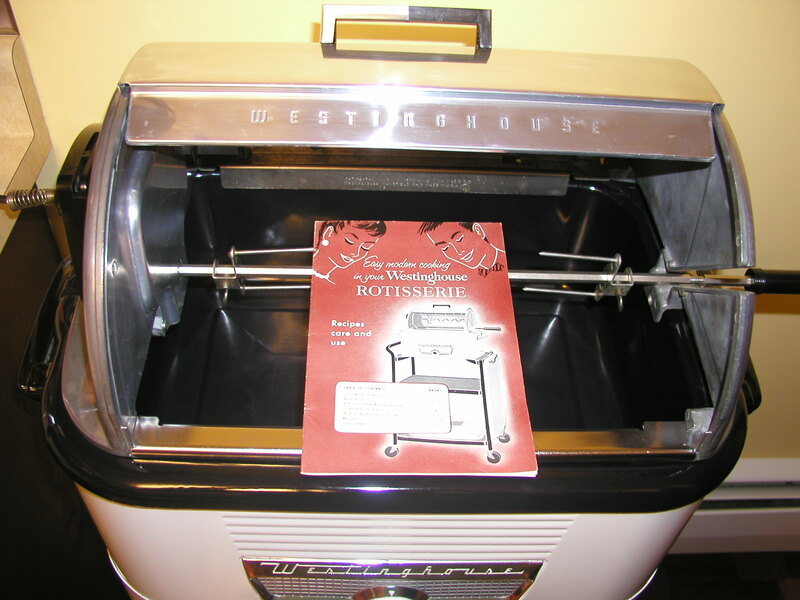 1952 Westinghouse Roaster Manual: This is the manual that came with my own roaster, which I believe is Model RO-91. 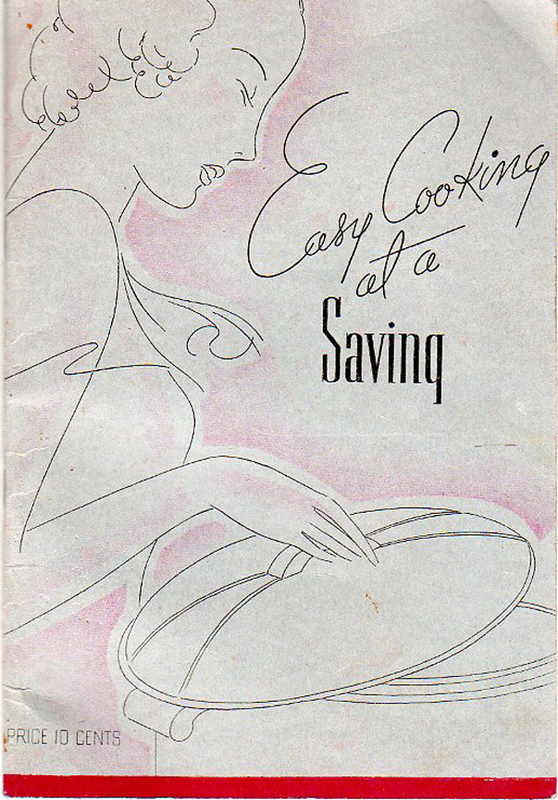 I have only scanned some of the recipes. In addition to the Roaster manuals, Roberta (THANK YOU!) 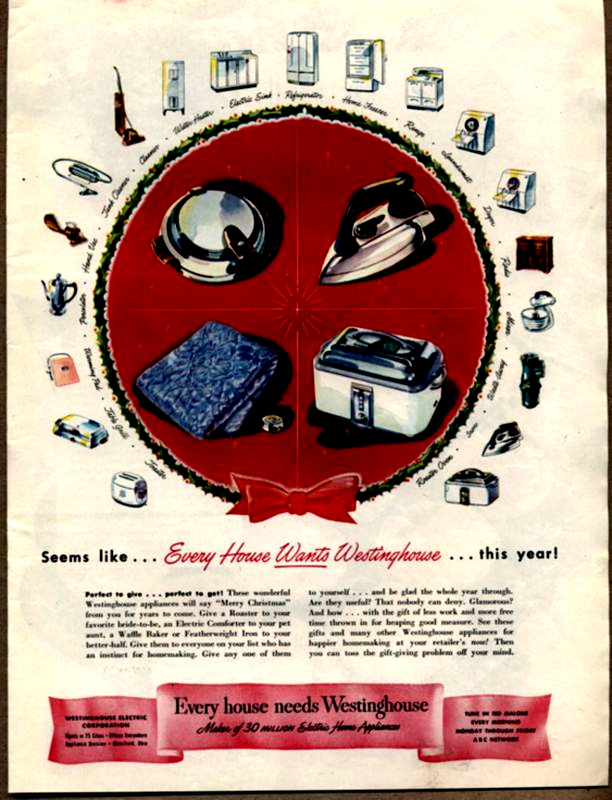 has privided a rather lengthy WWII Era book on the care and use of electrical appliances that is (of course) a thinly veiled advertisement for other Westinghouse products. 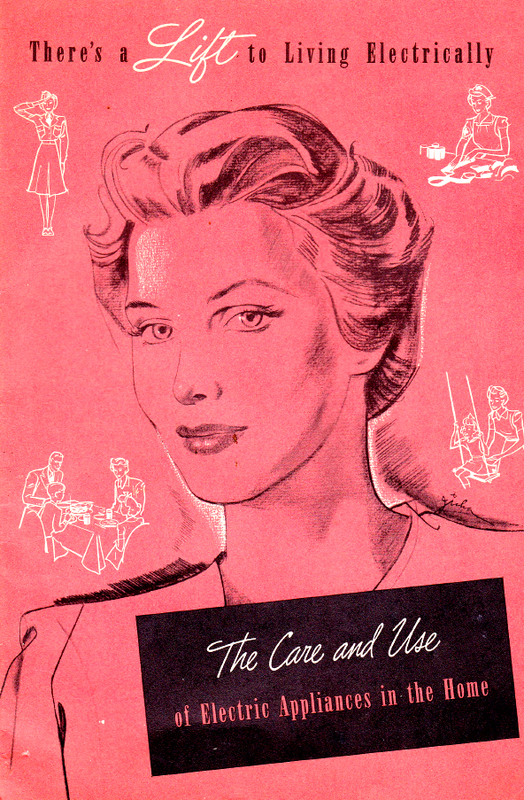 Note that on the cover, the stylish young lady is portrayed as a homemaker, volunteer, worker (in a defense plant) and Mother. "There's a LIFT to Living Electrically"
Please feel free to send us scans of any Roaster Manuals or brochures that you may have. 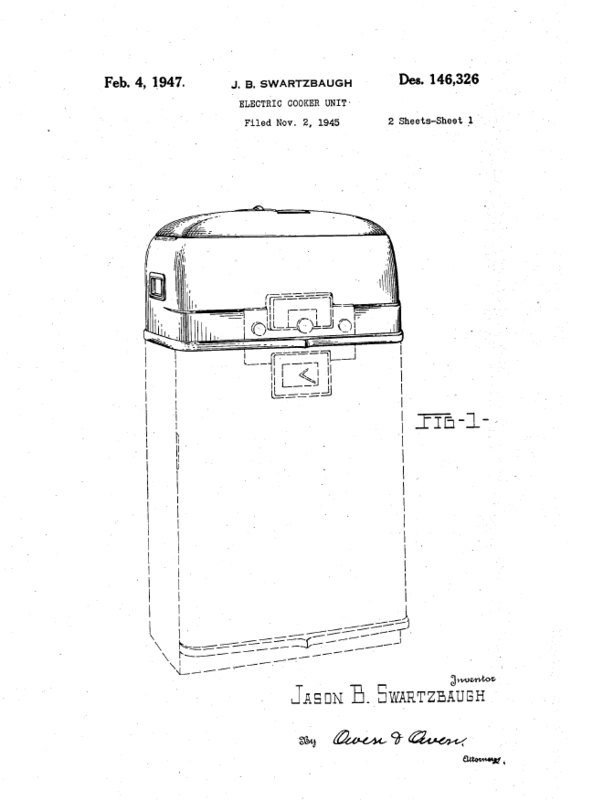 Westinghouse wasn't the only company making roasters. 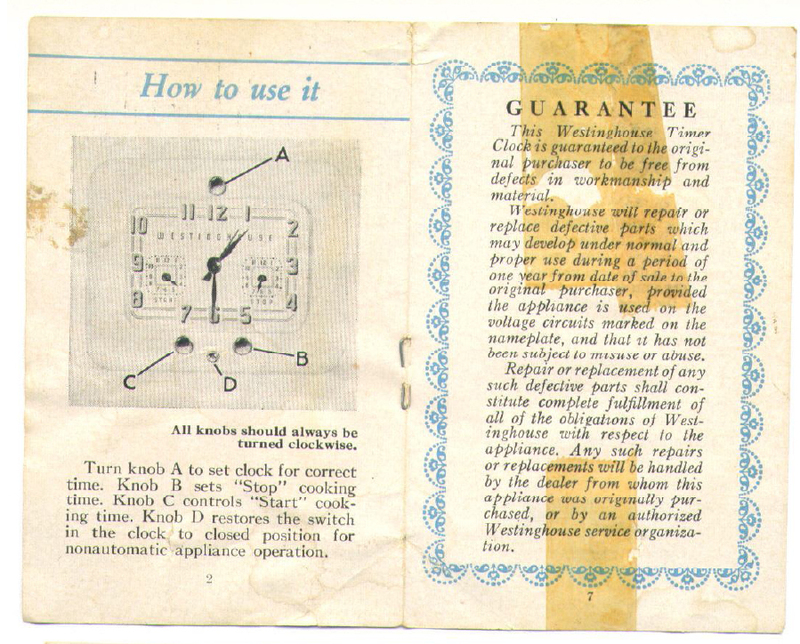 Here's the cover of the instruction manual for the General Electric version. "... 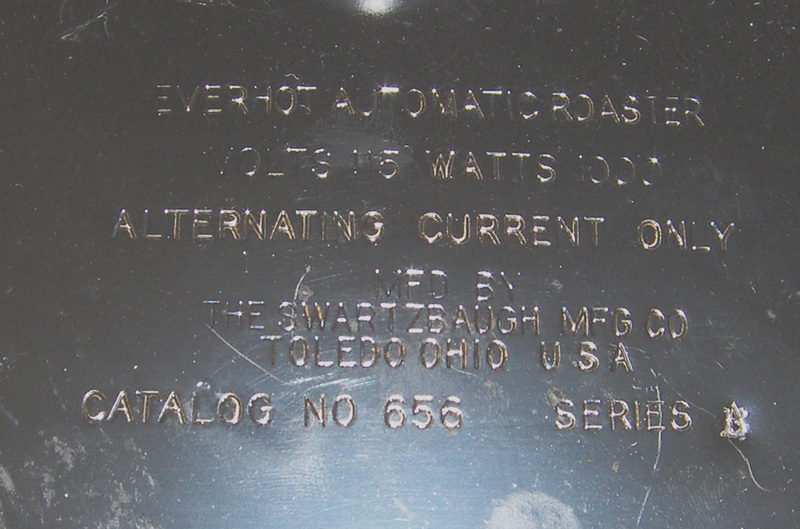 I think my Everhot roaster may be older than the oldest one on the Westinghouse Roaster page.It has the distinctive 'Art Deco' styling. It is a series A/B - the A has been overstruck with a B. It was received as a wedding present in August 1937 and was never used. The interior is pristine. 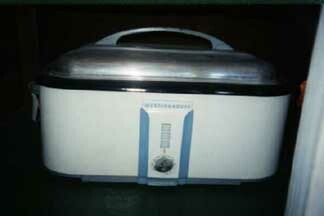 I have the original box which is a bit fragile.And I have the original instruction and recipe book. 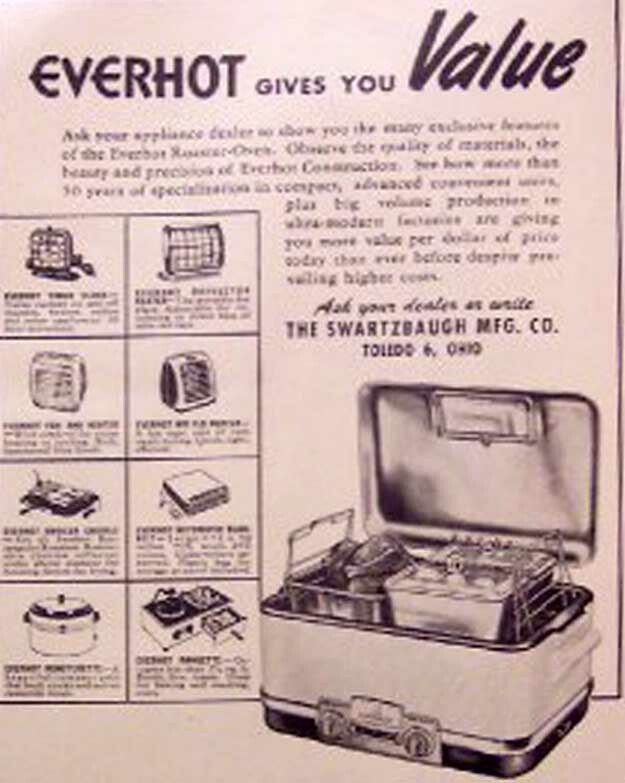 ..."
The EverHot Roaster was designed as a competitor to the Westinghouse Roaster -- it even had its own Timer and Stand -- which closely resemble the Westinghouse products. Alas, after the War, the Swartzbaugh folks fell victim to McGraw Edison and ultimately to the depredations of the Bersted Company, known for cheap, cheesy Drug Store Appliances. 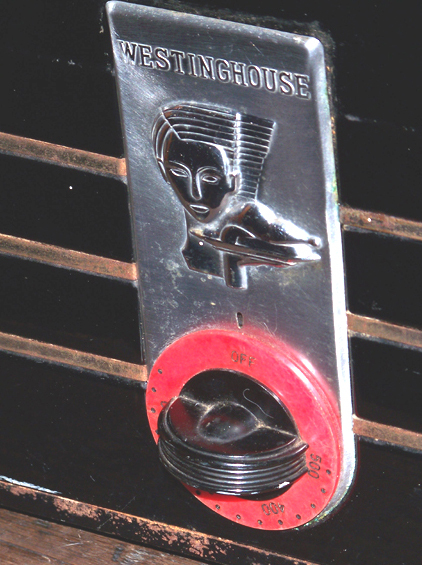 And, the lovely Art Deco styling of the roaster slowly vanished. 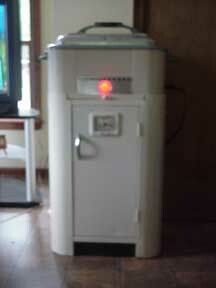 Andrea not only sent us photos but also the Manua for the Everhot Roaster. 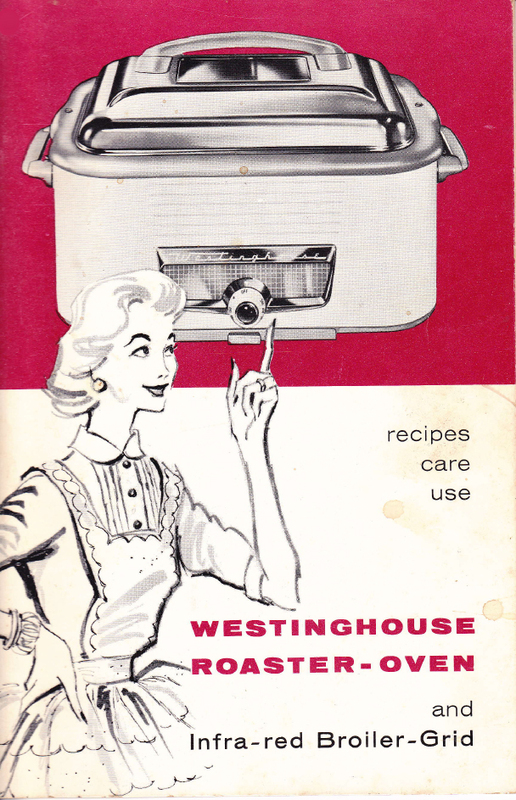 Westinghouse was one of America's industrial powerhouses -- literally and figuratively. 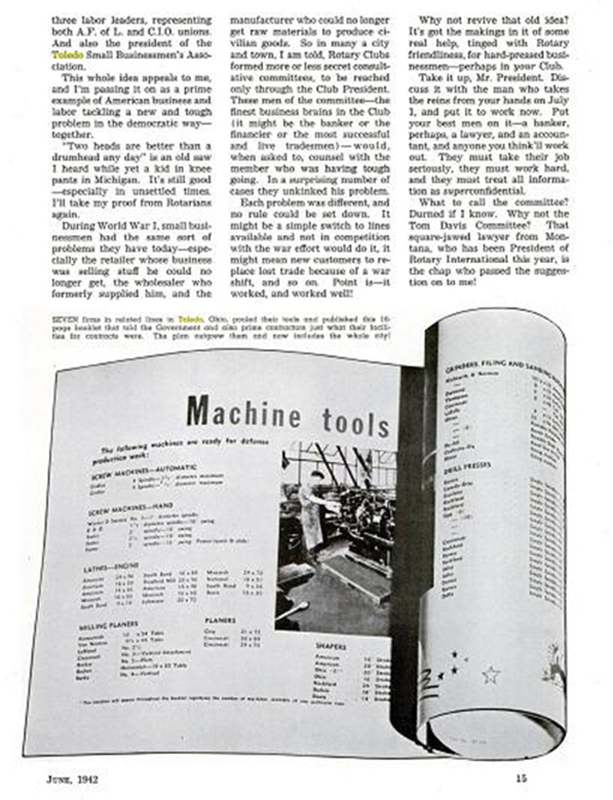 The company made thousands of useful products and employed many, many people in good, solid, stable jobs. Here is a photo of a gigantic monument to George Westinghouse that still stands in Schenley Park on the East Side of Pittsburgh. 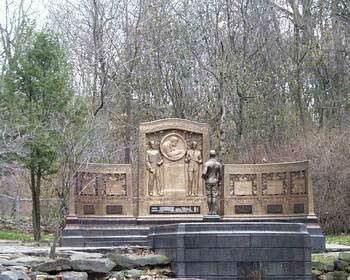 The monument shows "youth" (in the foreground) gazing across a large reflecting pool ("history") remembering the achievements of Mr. Westinghouse, listed in detail on the various panels. Indeed, these achievements are significant and worthy of admiration - the Air Brake, the Dynamo, Broadcast Radio, in short all the precursors of our modern society. 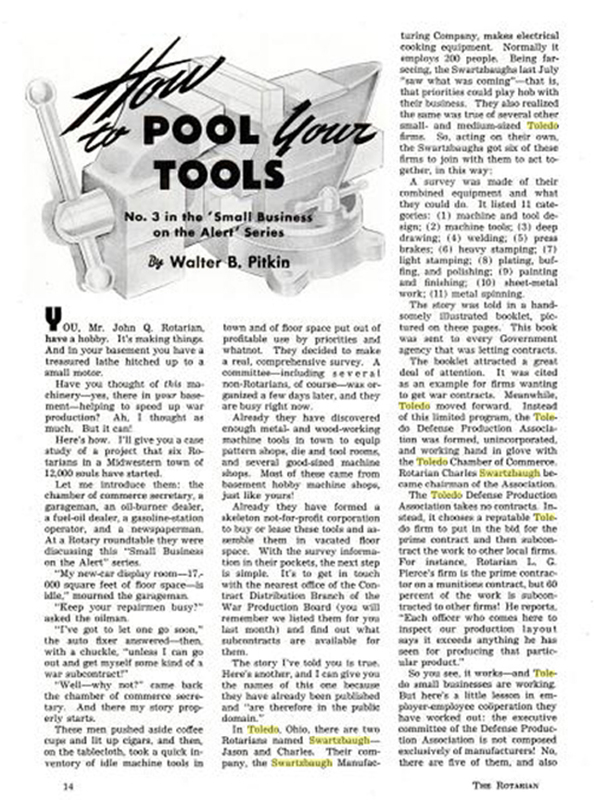 During the 1980's and 1990's, Westinghouse Electric Corporation sold all of its industrial assets and focused on its media businesses. In 1997, Westinghouse was renamed CBS Corporation and in 2000 merged with Viacom Inc. (a media company). 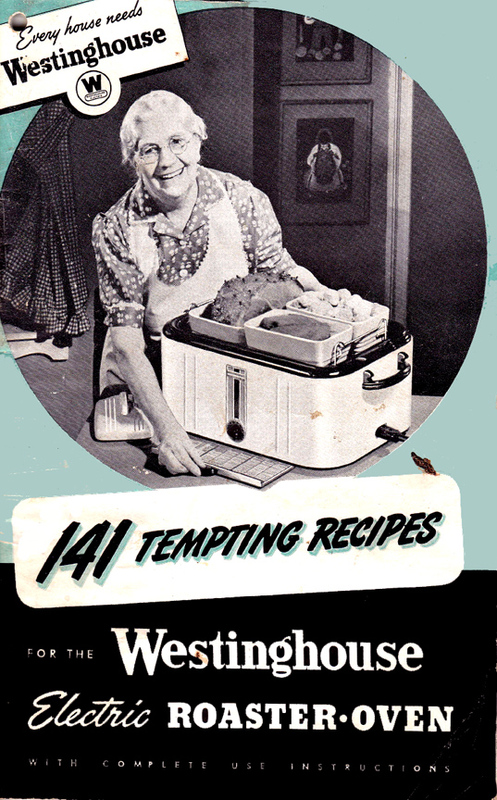 Westinghouse is a subsidiary of Viacom Inc. and licensor of the Westinghouse name for consumer products. 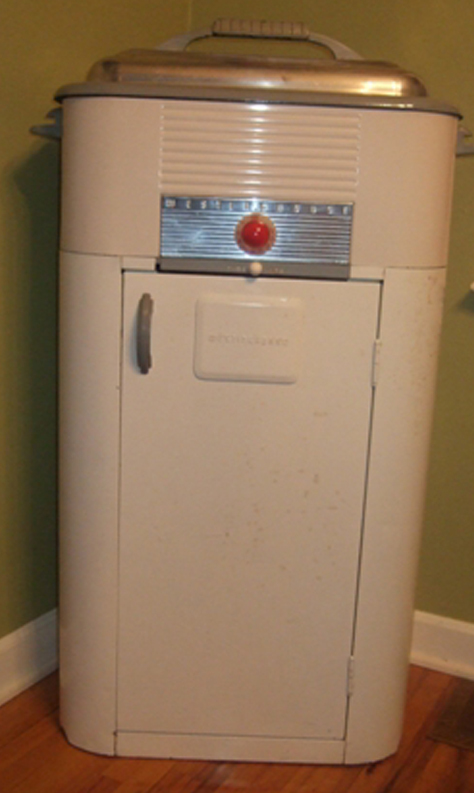 In 1972, the historical Westinghouse small appliance business was sold to Scoville Manufacturing. Scoville went out of business in the 1980's. 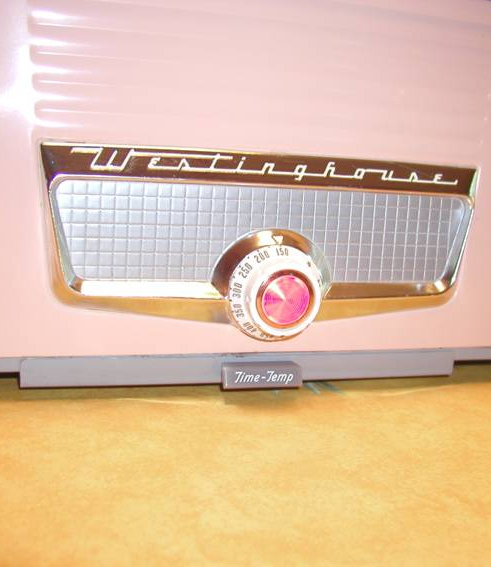 Today's Westinghouse appliances are made by Salton (phone 800-947-3745, e-mail salton@saltonusa.com). Needless to say, they are manufactured in far-off dictatorships where "Unions", "Benefits" and "Decent Life Style" are not words in the language. You provide the money while smirking MBAs conspire with foreign tyrants to reap the rewards. If the monument (above) were to be constructed today, "youth" would be shown burdened with debt and insecurity while being forced to gaze across a vast ocean to watch the antics of sybaritic foreign potentates as they are served by a cadre of shameless Americans who are willing to sell out the future for a BMW today. 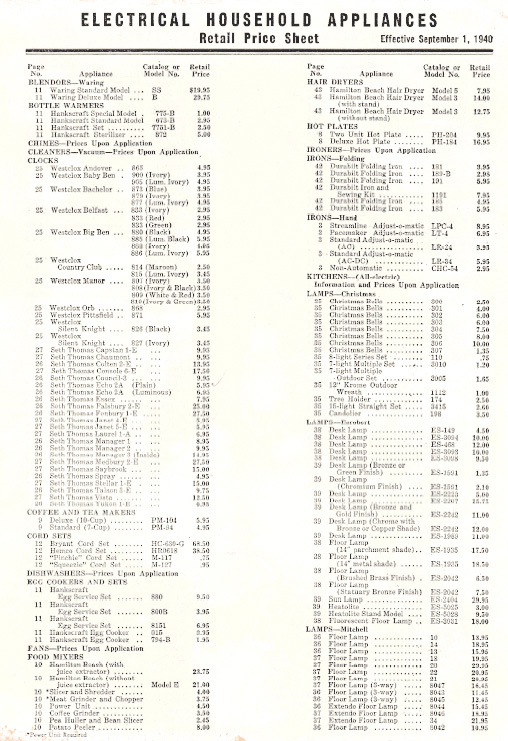 Principally due to a large tax deduction, most of the Westinghouse corporate historical records were given to the George Westinghouse Museum, 325 Commerce Street, Wilmerding, PA 15148; phone: 412-823-5000; e-mail museum@georgewestinghouse.com; website http://www.georgewestinghouse.com/museum.html; or the Senator John Heinz Pittsburgh Regional History Center, 1212 Small Street, Pittsburgh, PA 15222; phone 412-454-6000; e-mail hswp@hswp.org. 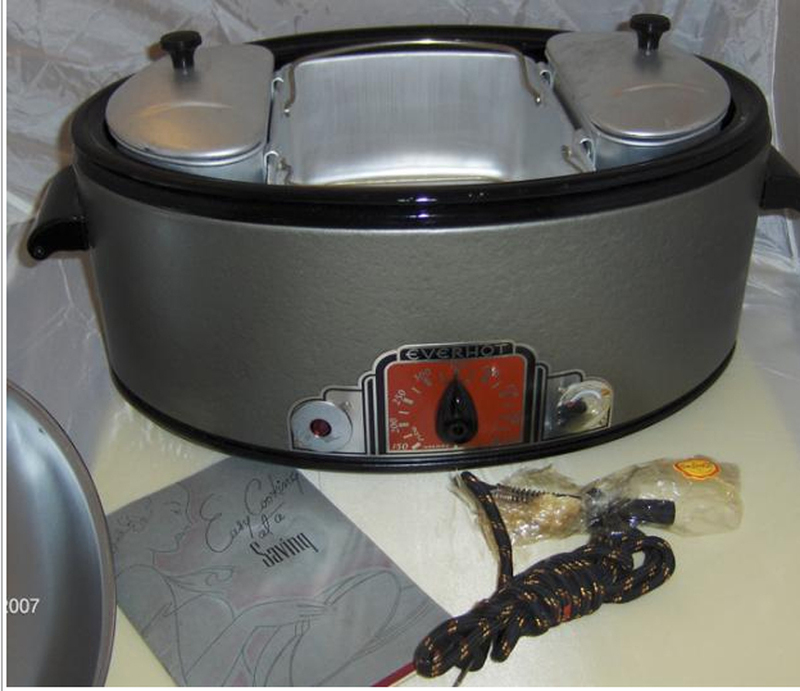 The paint which I used on the insulated sides of my roaster may be found at auto specialty stores Click Here for one source of the paint. This is gloss white auto engine paint which is good up to 500 degrees Fahrenheit. It's about $6 a can plus about $4 in shipping. For a roaster, buy two cans "just in case". You must be VERY VERY careful in applying the paint. The surface must be cleaned several times with a high quality degreaser. Then it must be "etched" with an acid product. (Paint will NOT stick to a smooth porcelanized surface). Finally, the paint must be evenly sprayed on the surface in many small coats. Allow plenty of time for each coat to harden thoroughly before applying the next. Do NOT use this technique for a Stove Top!! 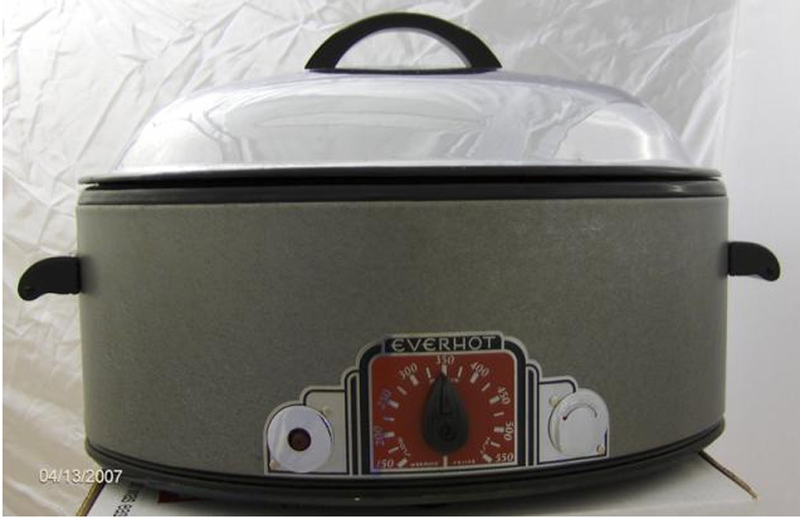 The sides of a roaster are a whole lot different than an actual stove top. 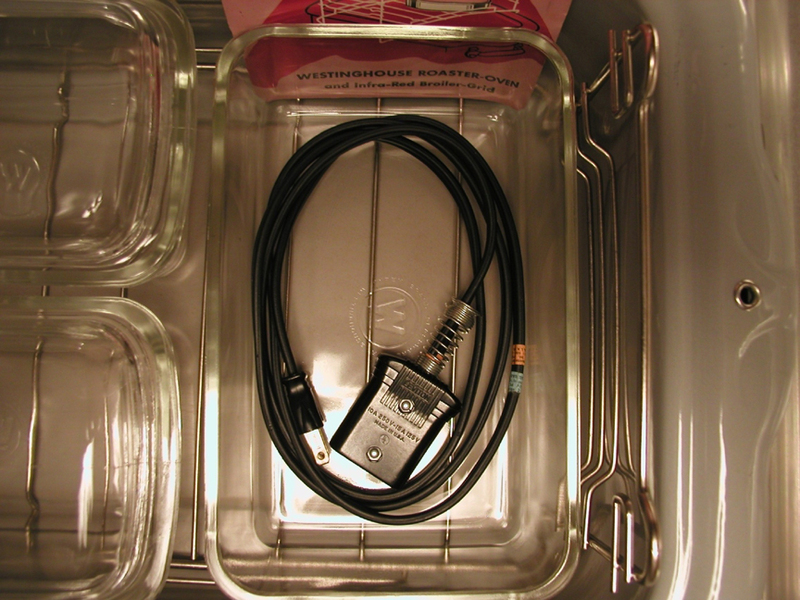 An electric range can have temps that may exceed the 500 degree mark. Further, on a stove the finish is actually exposed to the radiant heat from either the electric element or the gas flame. Even muffler or header paint which goes up to 1500 degrees might yellow under these circumstances (besides, gloss paints can't be made for these temperature ranges). 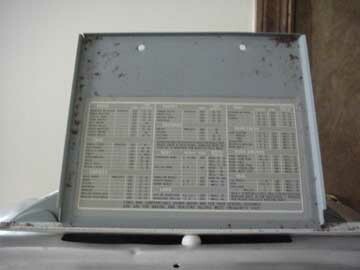 If you want to refinish a Stove Top, look in your yellow pages for auto repair paint shops. What you want is something called a "powder coat" which is used for all kinds of high heat or high corrosion situations. Hot rodders want their exhaust systems to be glossy colors, and many restorationists want the actual frame of the car to be totally impervious to rust. 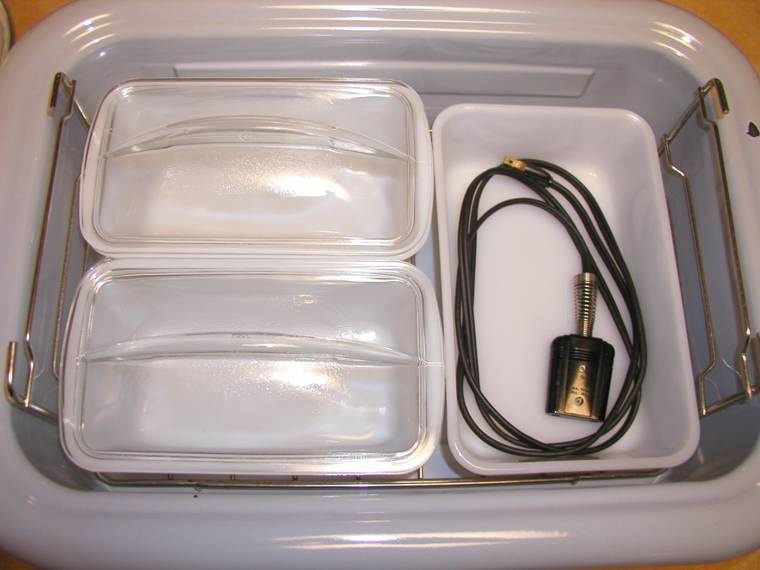 In this process, a powder is affixed to the metal and then baked on under high heat. This is almost the same thing as firing a clay pot with enamel, or the process used to make your stove top. This is STRICTLY NOT a do-it-yourself project and can be expensive because the materials are useless shortly after the can has been opened. 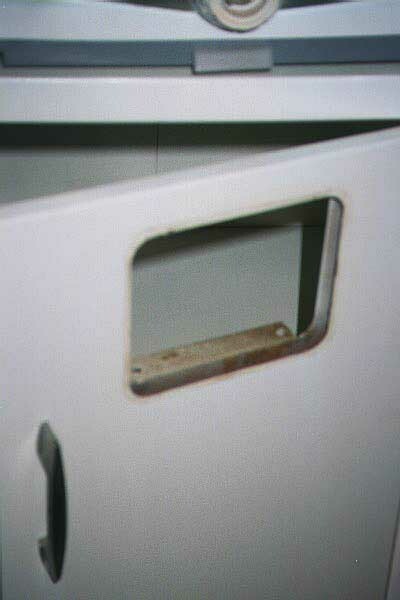 You might find a fellow who is going to do a gloss white batch and maybe he will include your stovetop in the lot. 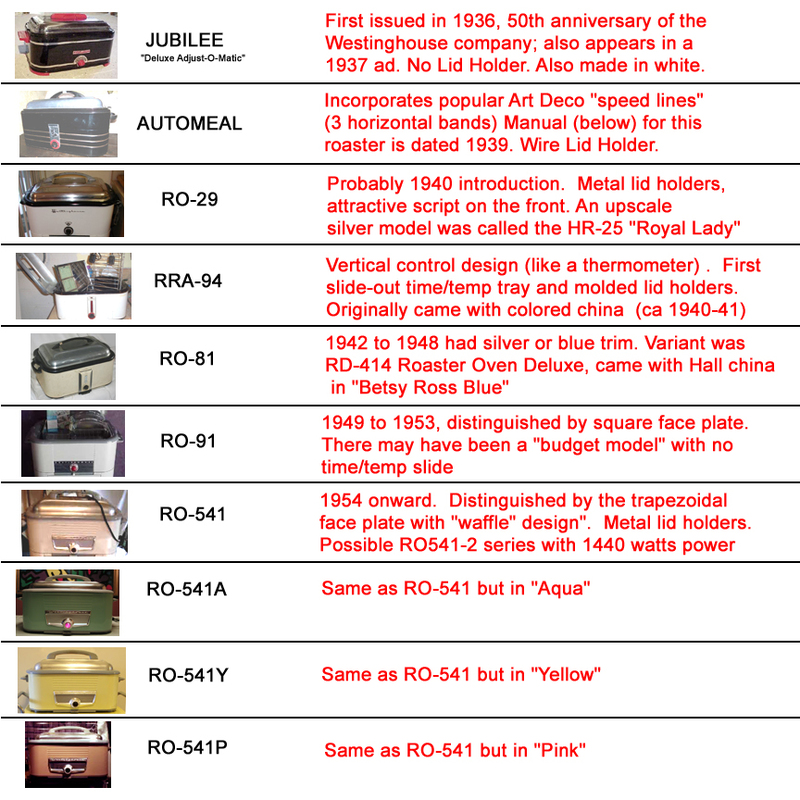 Restored stoves often sell for for $1,500 - $3,000 because it is SOO difficult to refinish the porcelain. 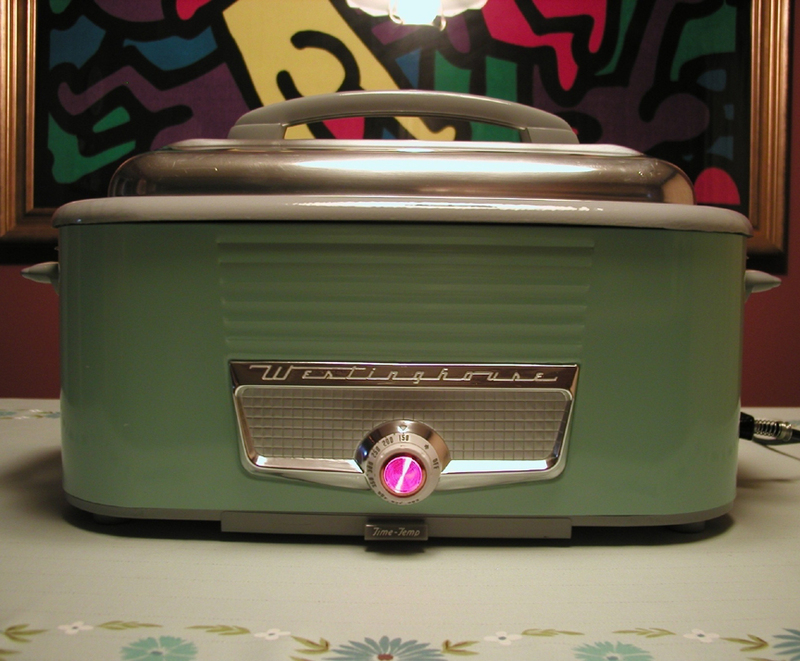 Send us pictures of YOUR Westinghouse Roaster!